If the name Al Shahab is unfamiliar, it’s because they are from Saudi Arabia. Last night I was at Tancheon Stadium watching Seongnam take them on in the second leg of their Asian Champions League semi-final. Al Shahab held a 4-3 lead from the first leg and so barring a goalfest, a win by a single goal would be enough to take the Korean team through on away goals. Jen had managed to get us free tickets through some Facebook group she was in, although I doubt too many people actually ever pay to get into Seongnam. They regularly give away tickets to schools and colleges to boost their crowds which on the occasions I’ve been there so far have still been well under a thousand. I was late getting to the stadium and as I got nearer it sounded as if the attendance was way above the usual turnout. I’d missed the kick-off and I could hear the roar of the crowd from the other side of the river. I met Jen outside and we made our way into the north stand, which is the section behind the goal where the home fans congregate. Last time I was here, there were about thirty fans in the stand. They made a decent effort to get behind their team but with so few of them it wasnt much of an atmosphere. This time though, the stand was just about full as was the east stand to our left. With us being fifteen minutes late, we had to just take seats a couple of rows from the front which wasn’t a great view. The running track meant that we were a long way from the pitch and the advertising boards obscured our view of the players legs from their knees downwards. 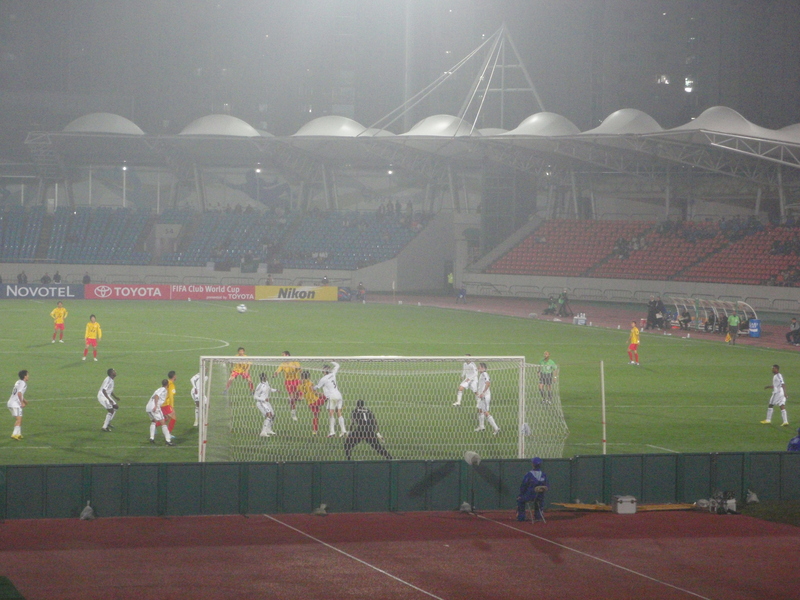 It was a fairly even first half, the Saudi’s looked a decent team, but Seongnam were creating plenty of chances. 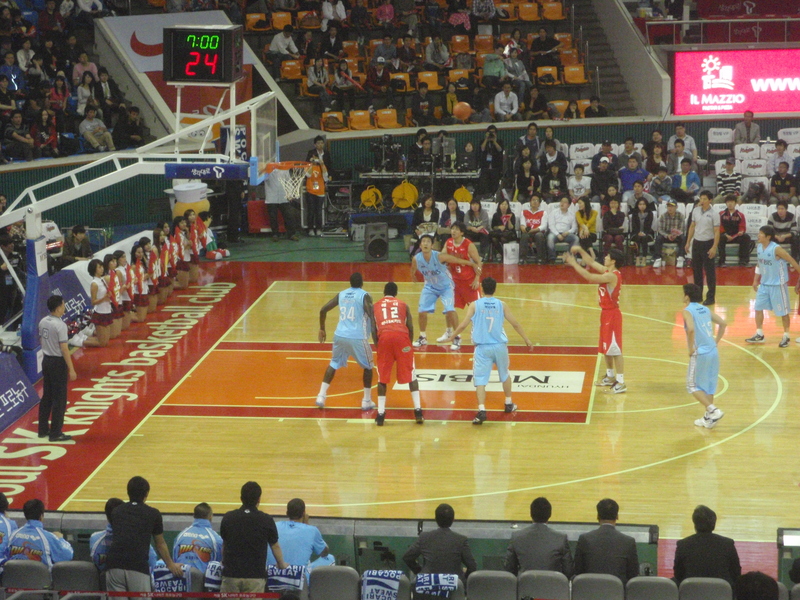 They managed to take one after half an hour when Jo Dong Keun finished after a flick on from Dzenan Radoncic. That put them level at four each on aggregate but ahead on away goals. 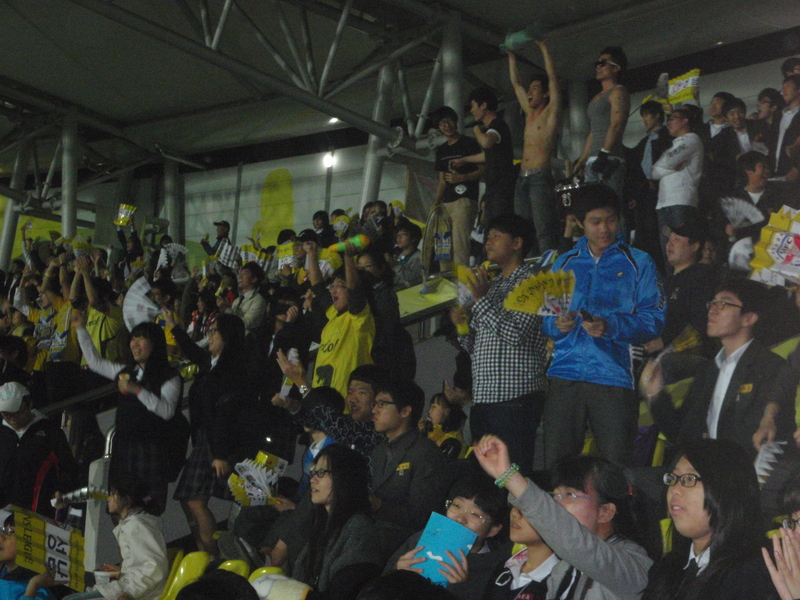 The fans around us celebrated as a trip toTokyo for the final beckoned. At half time I got a couple of beers and we moved further back for a slightly better view. The area that we moved to was a bit livelier too, with more kids in it than a goat orphanage. Most of the crowd had those bits of cardboard that you can either hold up as a sign or fold into something that makes a noise when you strike something with it. Initially they were hitting them against the backs of chairs or themselves. However, as most of the supporters around us appeared to be teenage lads, it wasnt long before they were all hitting each other. None of it was particularly aggressive and a lot of it seemed subconcious, it’s just the way fourteen year old boys behave with each other. At times, it was more entertaining than the match as they would wait until one of them looked the other way, or glanced at the match before catching him unawares. I'm glad I'm not a teacher. We spent about ten minutes watching them whacking each other on the head until I couldn’t resist it any longer and after picking up and folding my own bit of cardboard, I gave a couple of them in front of me what is traditionally known as ’a clip’. Their mates seemed to appreciate it even if the recipients didn’t. Actual bodily harm? Possibly. But worth it. The second half was pretty open, with both teams having opportunities on the break. 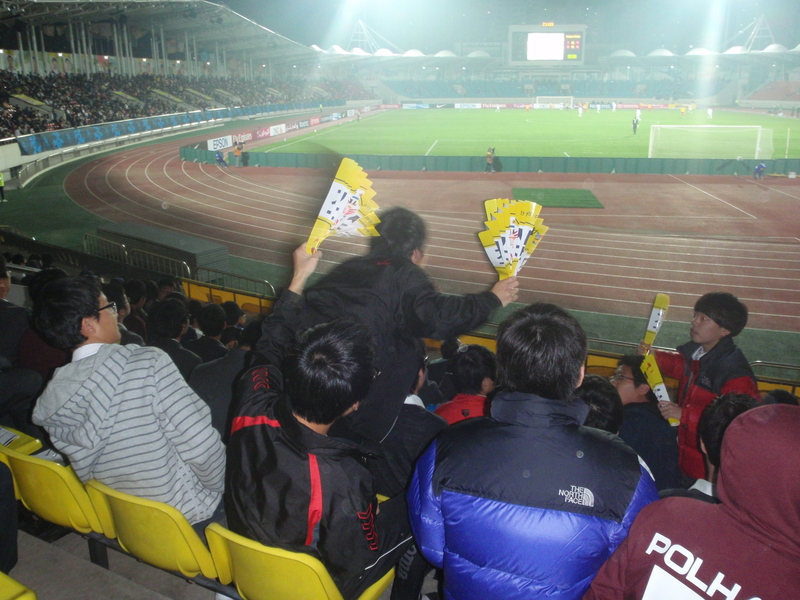 Neither side managed to take its chances though and eventually the ref blew to send Seongnam into the final. As we left it seemed as if half the crowd were cracking each other on their skulls with the bits of cardboard. I hope it catches on elsewhere. 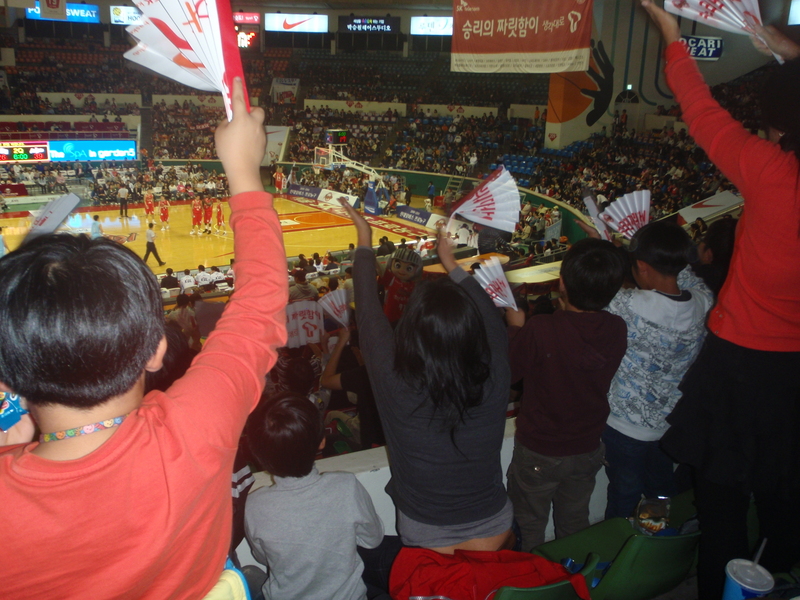 As the baseball season draws to a close, the gap in the Korean sporting calendar is filled by the beginning of the basketball season. It doesn’t have the benefit of allowing you to sit outside on a sunny afternoon or evening, but at least it’s live sport. I’ve always enjoyed basketball. I played for a few years as a kid at school and then took it up again for a few months a couple of years ago when I was working near Southampton. As far as watching it is concerned I was a regular at the local women’s team in Norton when I was about thirteen. I’d like to say it was the quality of the play and the presence of a number of international players that attracted my friends and I. It’s more likely though that it was the gym knickers that they wore that kept us turning up each week. I’ve managed to see a few NBA games too, on visits to America. 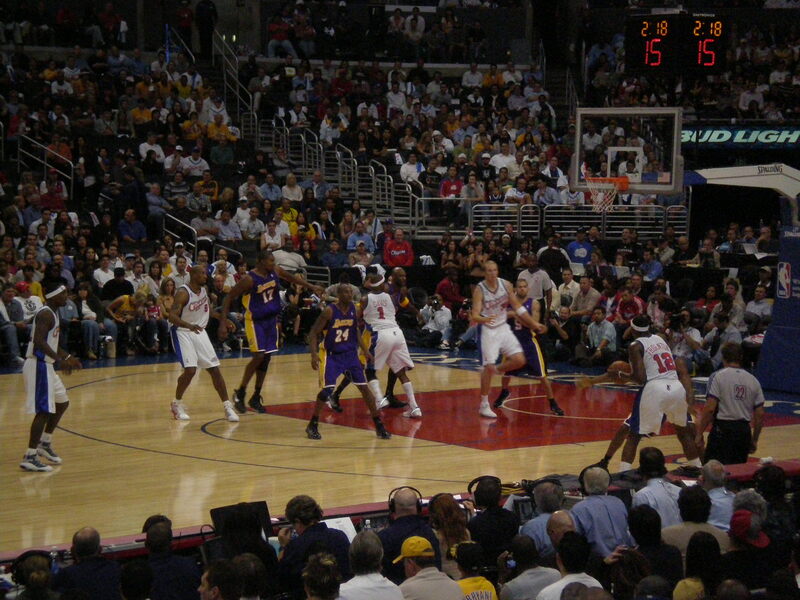 Mainly Orlando Magic against various opponents in Florida, but a couple of years ago I saw Kobe Bryant play in the LA Lakers v Clippers derby. It wasn't very much like this at all. I wasn’t expecting NBA standard games in Korea, but providing the games are competitive I thought that it might be an interesting way of spending a couple of hours. 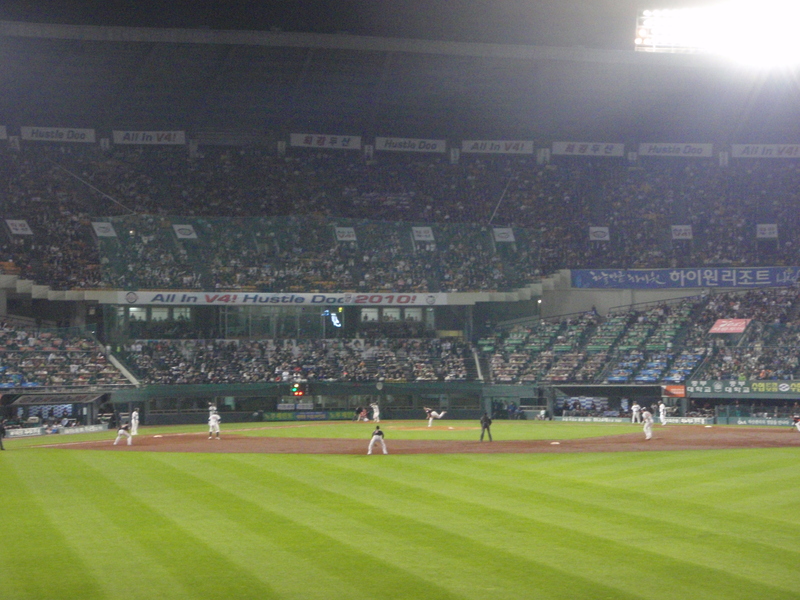 SK Knights play at the Jamsil Students Gymnasium, which is right next door to the baseball ground shared by Doosan Bears and LG Twins. It’s only three stops from my apartment on the subway, but as this game took place on a Sunday, I thought I’d walk it for a change. 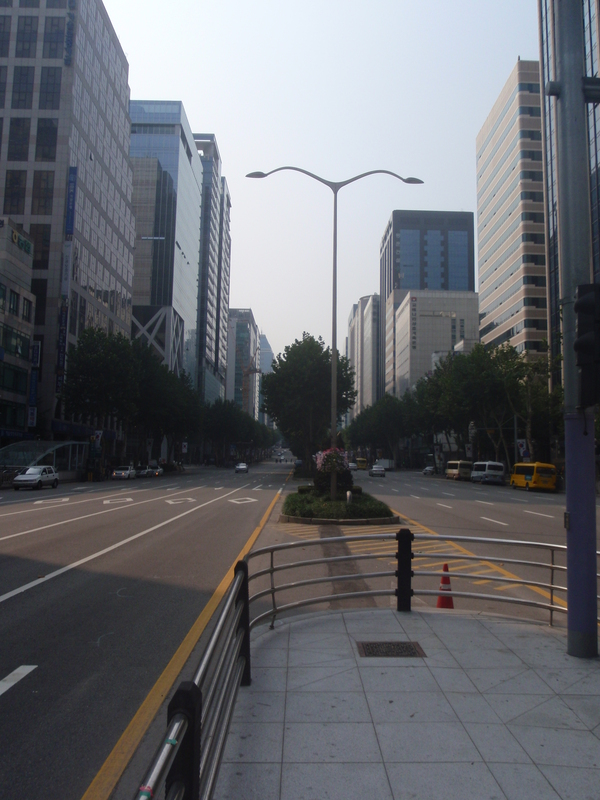 The streets are a lot quieter on a Sunday afternoon, although the traffic tends to pick up a bit later in the evening. There are normally one or two more cars than this. 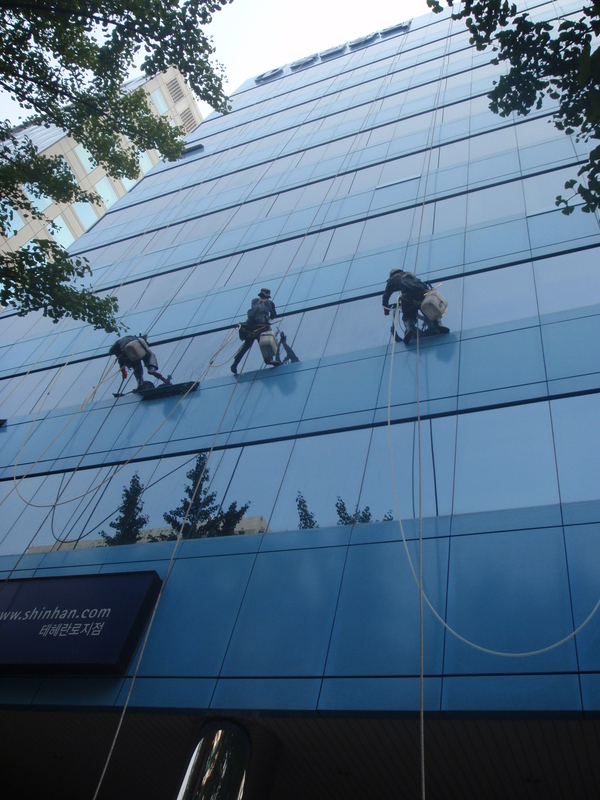 There wasn’t a lot going on as I walked towards the Sports Complex, but I did notice some abseiling window cleaners. Mildly more interesting than photographs of streets without much traffic. One of the reasons why I fancied the walk is that I wanted to check out the Tancheon River, primarily to see if it would be easy enough to get to on my bike and whether or not it had a lit cyclepath alongside it. 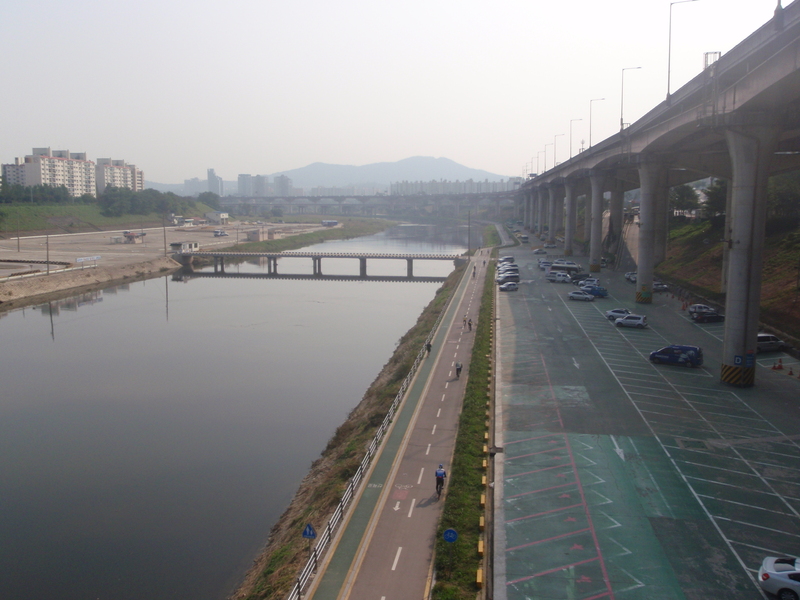 I got there after about forty minutes and it looked ideal, both for cycling southwards towards Bundang or heading in the opposite direction to connect with the Han River. I paused as I was crossing the bridge and looked down into the water. On what appeared to be the shallower side to my right I could see some large fish that might have been carp. 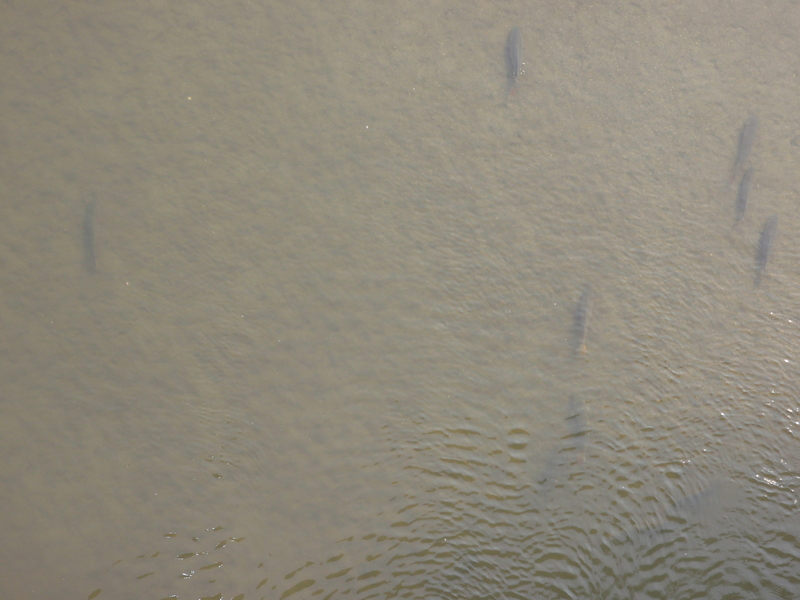 They were about eighteen inches long and were just sat on the bottom of the river, facing upstream and barely moving. Occasionally they would shimmy sideways a little or disturb the silt with their mouths. I was surprised that nobody was fishing from the bank or the bridge. Next time I walk that way I’ll take some bread or something to drop in and see if they will feed. I arrived at the stadium at about half past two, just as the ticket office was opening. 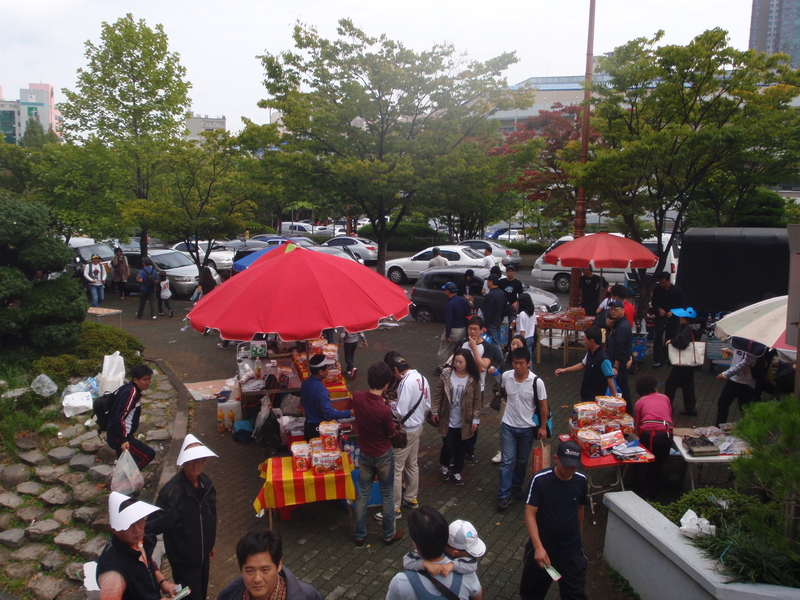 There were a few people hanging around and plenty of stalls selling the usual beer, squid and gimbap. 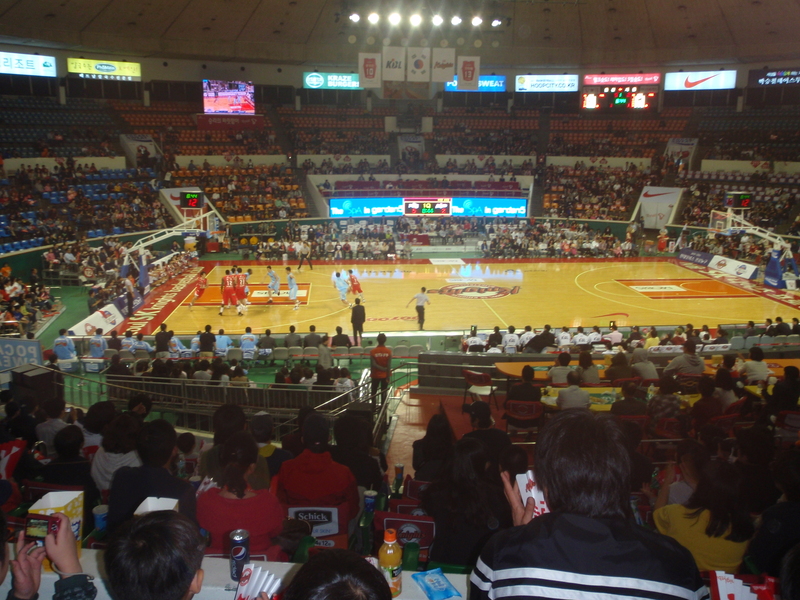 The tickets ranged from 30,000 won for courtside up to 4,000 won for the third tier behind the basket. 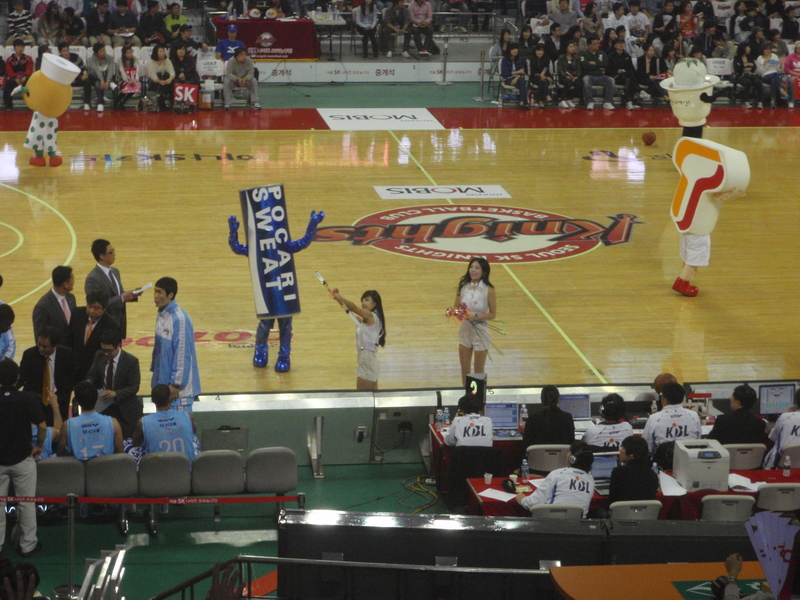 I paid 8,000 won for a seat in the second row of the third tier, square on to the court, if you know what I mean. 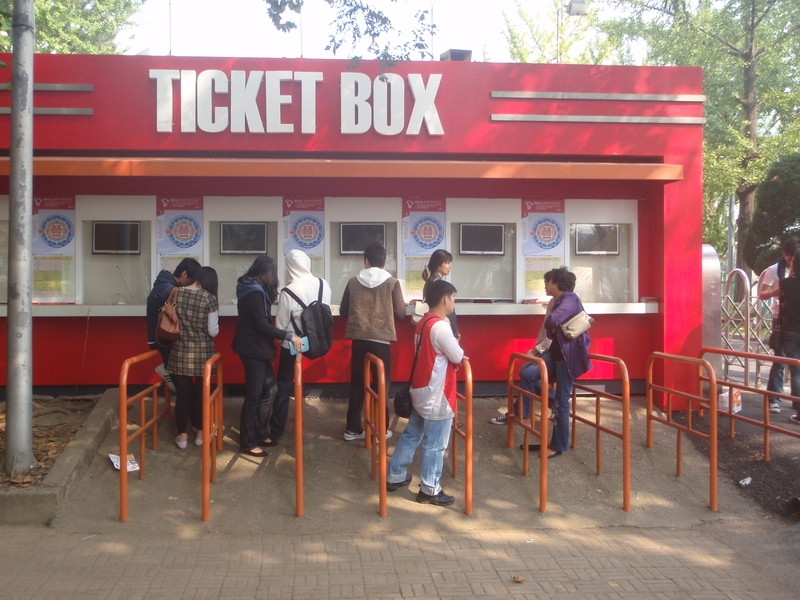 Ticket Office, complete with people hanging around. It was too early to wait around and so I got the subway back to my apartment and returned a couple of hours later. 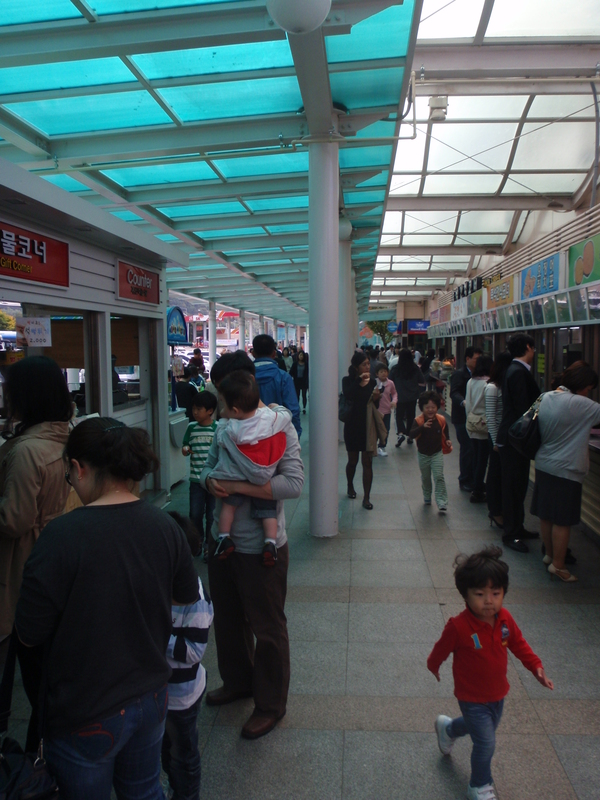 It was certainly a lot busier by that time and as I went inside there were big queues for the popcorn stands. My seat had already been taken by a small kid on what was probably a birthday trip with his mates. The venue wasn’t full though and there were plenty of alternative seats to choose from. I stayed in the second row of the third tier, but just moved along a bit. It was quite a small place and you would have a decent view even if you were sat in the back row. It seemed close in real life. From what I can work out of the rules, each team is allowed two non-Koreans, but can only have one of them on the court at a time. Both teams started with an American centre and the two of them virtually played a private game against each other. It was like when you were having a kickaround as a kid and a couple of blokes on the way back from the pub joined in, one on each team. The Americans played 'one on one'. They had cheerleaders too, although they did look at little on the young side to ogle. They weren’t as athletic as the cheerleaders I’d seen in Los Angeles who had me worried by their tendency to throw each other twenty feet up into the air. 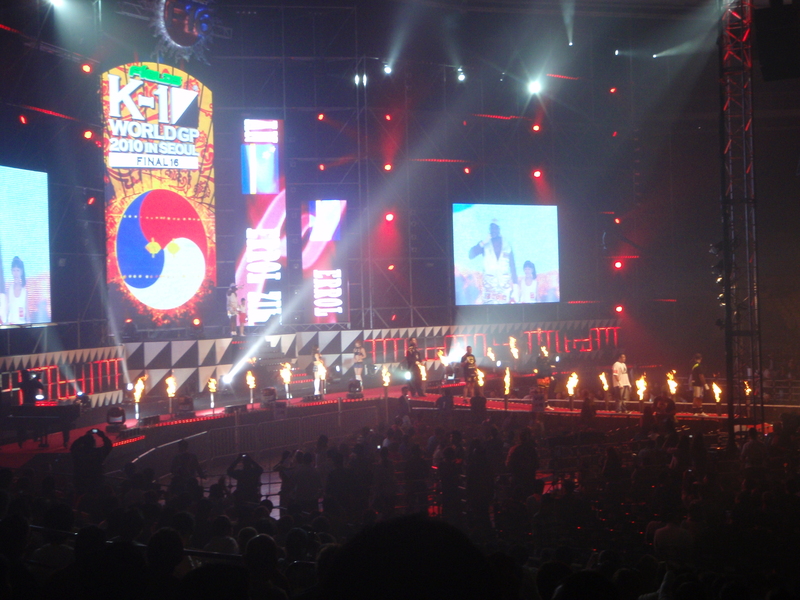 The Koreans made up for this though by throwing stuff into the crowd at any opportunity. They had those guns that fire tee-shirts, but also bows and arrows, frisbees and pizza in boxes that they very generously distributed. You'll have someones eye out. The game wasn’t particularly close. SK took an early lead and pretty much maintained a fifteen point buffer throughout the match. 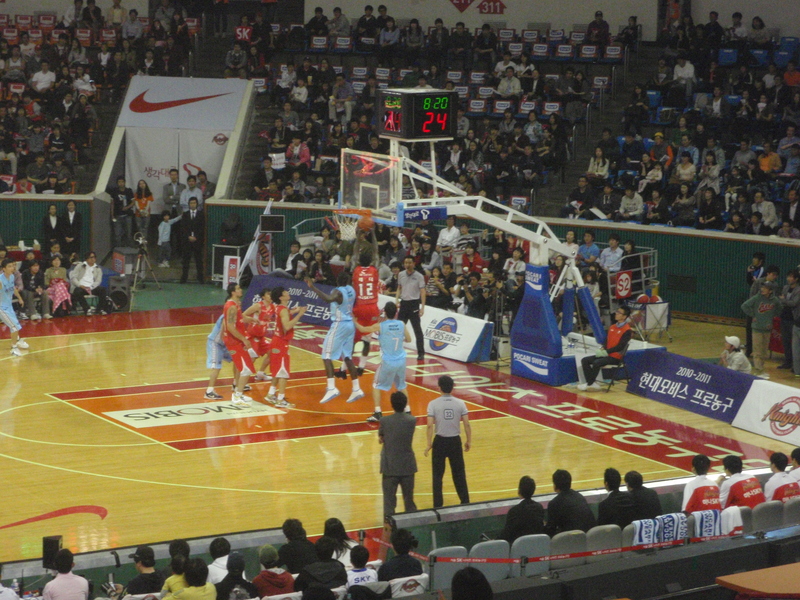 It got temporarily interesting in the final quarter when Busan reduced the deficit to six points at one stage, but they couldn’t ever completely close the gap. I couldn’t work the fans out. They made plenty of noise, but a lot of them seemed to be cheering for both teams. I suppose it’s one way of getting involved when you are a neutral. This lot cheered everything, from baskets at both ends to more popcorn arriving. Two hours later it was all over, SK running out winners by ninety points to seventy-eight. I’ll probably go back again in the hope of seeing an evenly matched game, but on first impression it doesn’t compare with sitting outside in the sun, sipping a beer and watching the baseball. Six days earlier I’d watched Samsung Lions losing away to Doosan Bears to fall 2-1 behind in their best-of-five games play-off. They had managed to win the two remaining matches though for a 3-2 overall win that had taken them into the Korean Series where regular season table-toppers SK Wyverns were waiting for them. It was best-of-seven this time and SK were already one game in front after the previous evenings contest in the same stadium. 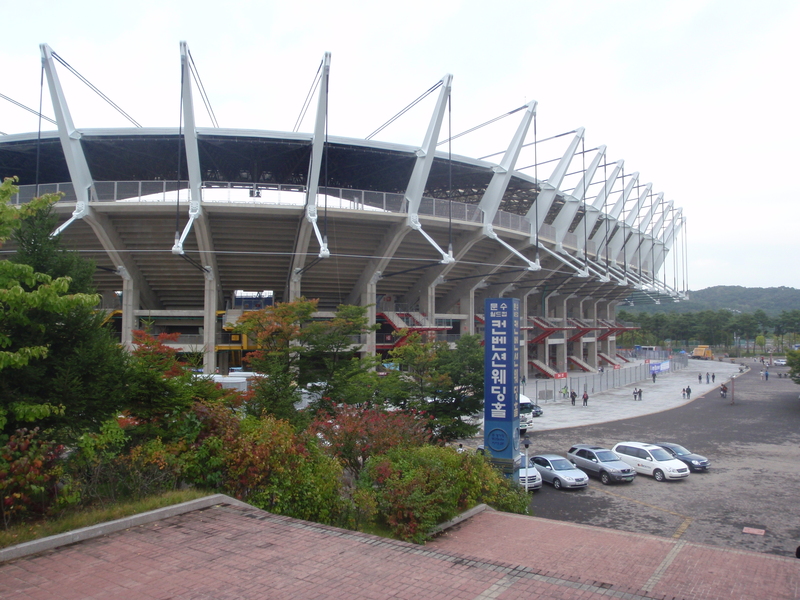 The way it works is that the first two matches are played at SK’s Munhak stadium, with the next two at Samsung’s place in Daegu. If games five, six and seven are required then they are scheduled for the Jamsil stadium in Seoul. On the way to the game. I’d had a few beers straight after work the night before with some of the lads out of the office and had watched a bit of the first game on the telly in the bar. To be honest, I can’t remember the score, just that SK Wyverns won and I even had to confirm that the next day. Beer sometimes has that effect on me. Mind you, I wasn’t as bad as earlier in the week when three of us had gone on from the same bar to a karaoke place fifty yards down the street. This was a lot posher than the one I’d been to in the summer, not surprisingly as it was all going onto someones corporate card. We’d already had a few pints of Cass and so it was time to move on to the whisky, which they sell you by the bottle. Judging from the signs I’ve seen outside similar places it probably cost about a hundred and fifty quid. We also had a few bottles of beer on the table and a large plate of chopped fruit. I was smoking Havana cigars, so the fruit wasn’t really of much interest to me. We warmed up with a few Beatles songs, and progressed to stuff like Anarchy in the UK, which on reflection probably isn’t the most appropriate selection for three middle-aged blokes straight from work in the business district to be trotting out before putting the bill on expenses. After about half an hour, we were joined by three young women, employees of the establishment. I was under the impression that most of the girls who work in the karaoke clubs that cater for business men with corporate cards must suffer from the heat a bit as I’m told that they usually remove their blouses after a song or two. Our hosts must have been feeling the cold that night as their clothes stayed on and they did no more than pick at the fruit and frown at my cigar smoke. An hour later after singing the odd ballad and topping up our glasses they cleared off, probably to find a room where the heating was turned up a bit more. We’d moved on to Neil Young by that point and sang for another half hour or so until the whisky was finished and we cleared off ourselves. I’ve digressed a bit there. Intentionally as it happens as I’ve noticed that these baseball reports are tending to follow a bit of a formula. I always seem to tell you the price of the tickets, what the fans were like and the score. Sometimes, if I can find it out somewhere else on the internet I might try and give the impression of knowing whats going on by including the name of some bloke who scored a home run. I wouldn’t recognise any of them in real life though even if they were dressed in their kit and hitting baseballs around my kitchen. So, after the distraction of the karaoke it’s back to the usual formula. My ticket cost me thirty thousand won. It had a face value of fifteen thousand won so that was pretty good I thought. 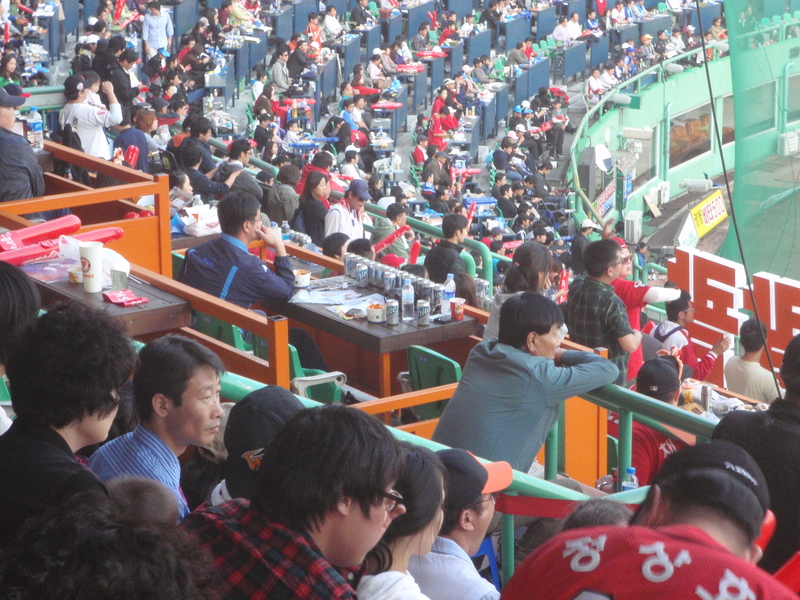 One of the best things about the Munhak stadium is that with the exception of the small posh area behind the plate you can sit anywhere you like. I got myself some fried pork dumplings (what I have to eat and drink is the other thing I always tell you) and took a seat in the main stand, just about at third base. 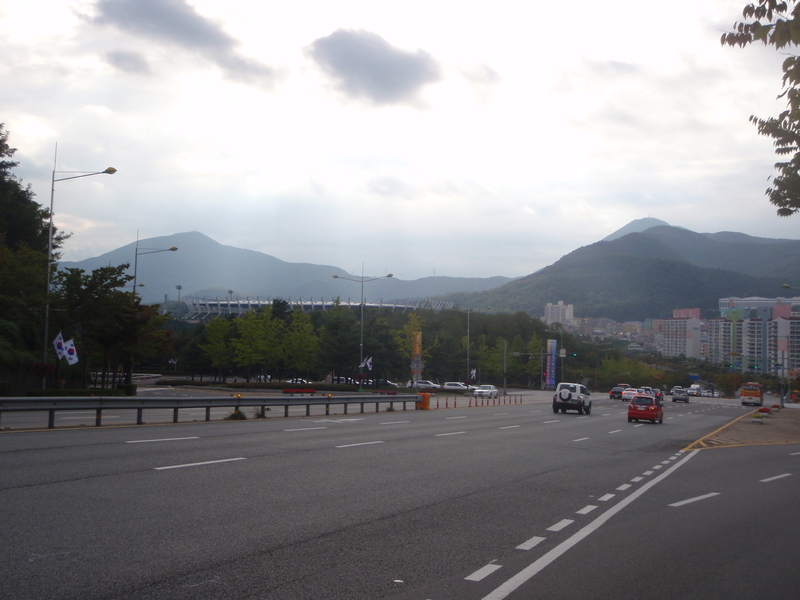 That's the Munhak World Cup Stadium in the background. By the time that game started at 2pm the place wasn’t quite full, but it didn’t take much longer afterwards for it to be standing room only. Disappointingly Samsung hadn’t brought their inflatable lions this time. 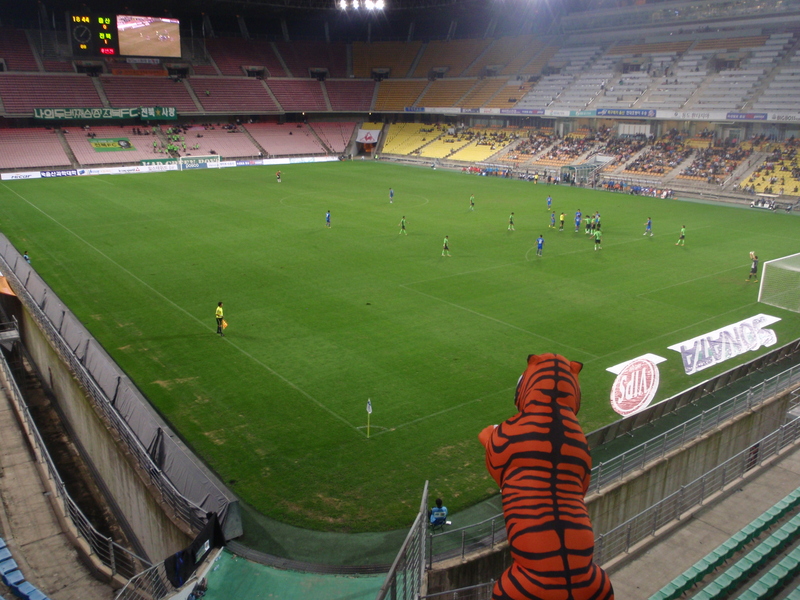 Although as I was sat with their fans I don’t suppose I’d have been too impressed had a twenty-foot tall big cat suddenly appeared in front of me, obscuring my view. 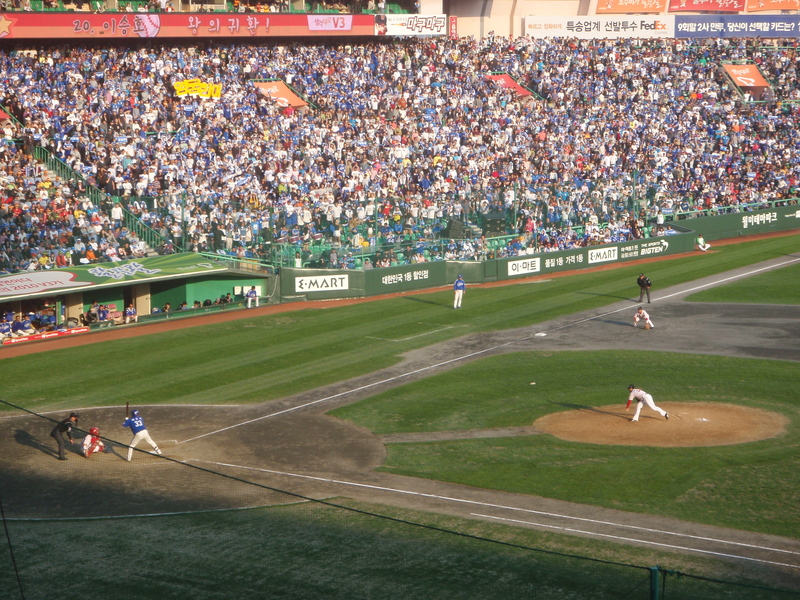 As far as the scoring went, Samsung went into a one run lead in the second innings, causing the Wyverns starting pitcher to be withdrawn embarrassingly early. It didn’t take long for the home team to turn things around though and a two run homer from Choi Jeong put them ahead. The same fella scored another home run in the sixth innings to extend their lead before someone else added a run in the eighth to make it 4-1. It soon got better for SK Wyverns though. And the best news of the day? I finally managed to get my hands on a sparkler courtesy of the Wyverns fans. I’d moved around to the outfield for a change of scenery and some kid who was obviously unaware of my firework history kindly passed one to me as they were handing them out for their customary display. He's unlikely to run out of beer. It’s possible that this might be the last baseball game that I’ll see this season as SK Wyverns may very well tie up the series 4-0 in Daegu and make the final games at Jamsil unnecessary. I hope not as I’d like to see at least one more before it all finishes for the winter. And a gratuitous photo of a cheerleader to finish with. If you were wondering about Lee Dong Gook, I haven’t forgotten about him. He scored his fourteenth goal of the season in Jeonbuk’s 1-1 draw at home to league leaders Jeju United. The point kept Jeonbuk in fifth place and firmly on course for the play-offs, eight points ahead of seventh placed Suwon Bluewings and with only four games left. There are no league games next weekend as it’s the Korean FA Cup Final and I’ll be making my way down to Busan to watch Busan l’Park take on Suwon. In addition to picking up the trophy, the winner qualifies for the fourth Champions League spot. So, another visit to the fish market beckons, a bonfire on the beach and hopefully some fireworks both on and off the pitch. This one was only a friendly, but with the history between the two countries, it’s a friendly that matters. I’d learnt how to get the tickets from the Hana Bank before the last game and so a couple of weeks ago I popped into my local branch during my lunch break to get tickets for fellow Boro supporting exile Alan and myself. Of course, these things never run smoothly and despite it being only the second day of the tickets being on sale the first woman that I spoke to in the bank gave me the dreaded crossed arm gesture and advised me that the tickets were sold out. I suspected that at best she was mistaken and at worst she thought that the easiest option to reduce her workload on a lunchtime was to just send me away. I very nearly responded to her crossed arms with a gesture or two of my own, but thought better of it. Still, I must have looked so incredulous that one of her colleagues made a comment to her before asking me to wait a moment. Ten minutes later I had two tickets for the north west corner at 30,000 won apiece. Perhaps the confusion arose from the north stand being sold out. That’s the section where the more vocal of the home fans go and there’s obviously a bit more demand for that bit. 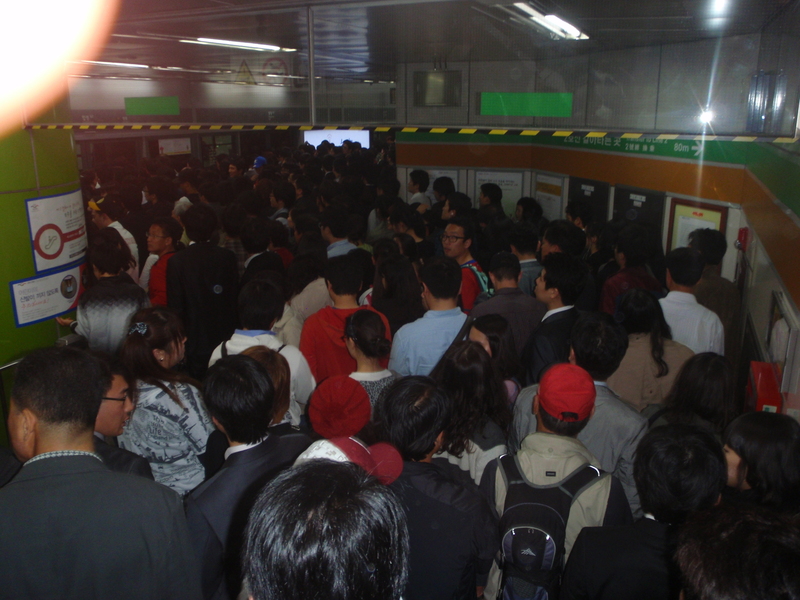 On the evening of the game the subway was especially busy and so it looked like there would be a decent sized crowd. I made the mistake though of not switching to Line 6 until Hapjeong, three stops before the World Cup Stadium subway station. It took me fifteen minutes to inch my way from the platform entrance to the doors of the train, by which time two packed trains had already been and gone as I watched from a few yards back in the queues. That's my thumb in the corner. Despite the delay I was still at the stadium by 7.30pm and I met Alan outside of the subway exit.There were far more people milling around than at last months game against Iran, which boded well for the atmosphere inside the ground. We made our way in and took our seats in the northwest corner. We were in the lower tier but twenty eight rows up, so we had a decent view. At that stage the ground was about half full, although as the game went on the crowd probably got to about eighty per cent of the stadium’s capacity, so there must have been about fifty thousand people there in total. 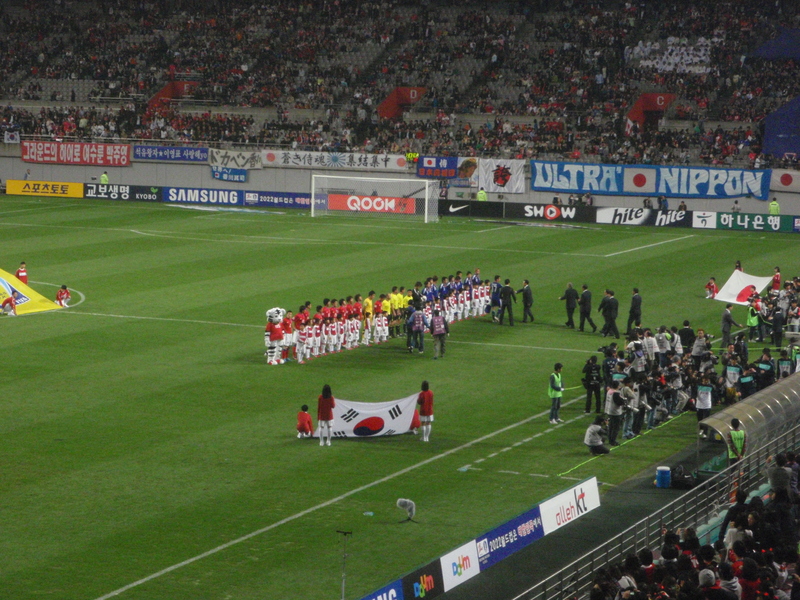 The Korean fans certainly didn’t show any respect to the Japanese, booing their anthem before the start and their players whenever they got the ball. It’s not surprising I suppose, when you’ve been invaded and occupied by your neighbours as frequently as Korea has been by Japan then there’s bound to be a bit of residual resentment. In additional to the oppression of the Korean people, most historical sites in Korea have also suffered at the hands of the Japanese one way or another. Just in case anyone might be unaware of this there are usually notice boards nearby telling you of the skullduggery. It might be that a particular building has had to be restored because the Japanese burnt it down in a temper, or that the original manuscripts that were once inside are missing because the Japanese wiped their arses with them. Usually any paintings that are on display are only copies due to the Japanese having using the larger of the originals as wallpaper pasting tables or something and the smaller ones to line their cat’s litter trays. I’m fairly sure that the next time I come to the World Cup stadium there will be a sign blaming this Japanese visit for everything from the divots on the pitch to the queues in the toilets. Non-stop support from the Koreans. The Koreans did, however, get behind their own team and there were gasps of anguish every time one of their attacks broke down or when Japan looked threatening. The fans in the north stand next to us kept up constant chanting and drumming throughout the game, waving the large flags at the front every few minutes and setting off flares early on. I’d like to try to get into that section for an international match. Particularly one with a sizeable crowd. Park Ji Sung wasn’t playing as apparently his knee was swollen with fluid after a training session. I doubt that Fergie will have been too happy about that. The absence of the Korean captain probably reduced the noise levels by a few decibels mind, and saved the medical staff from having to treat the numerous cases of hysteria that tend to break out whenever he touches the ball. The broadcaster still brought their dedicated Park Ji Sung camera crew with them though and every now and then a shot of him watching the game from the sidelines would be flashed up onto the big screen, no doubt with a caption that his knee injury wouldn’t have happened if the Japanese hadn’t agreed to the fixture. It’s fascinating to watch a Manchester United game on telly over here. Park Ji Sung is such a star in his home country that the half time highlights consist almost entirely of his efforts. Every one of his touches of the ball tend to be shown with little regard for anything else that went on. If he wasn’t involved in a build up to a goal, it probably wouldn’t qualify as a highlight and therefore would struggle to make the cut. If he was having a quiet game whilst Man Utd ran riot, you could be forgiven for thinking that it was still 0-0 if you were relying on the television half-time highlights for your information. 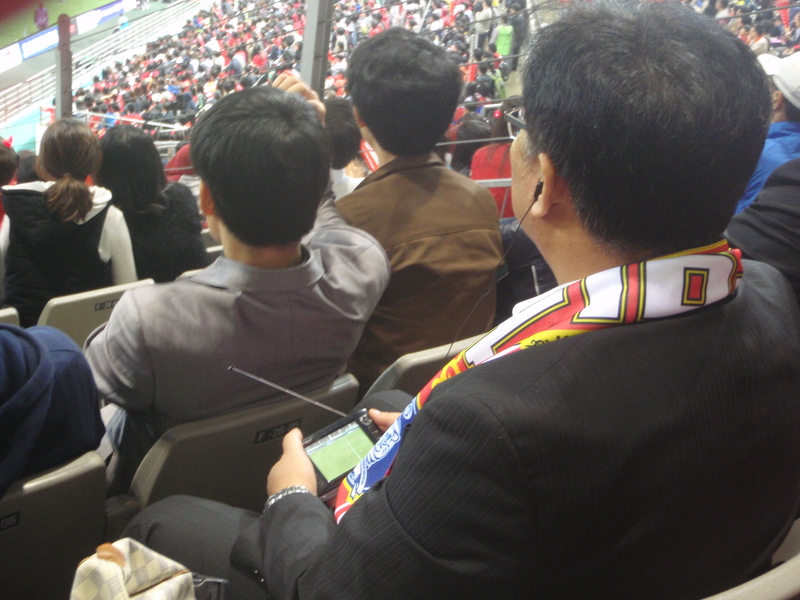 Keeping up with the latest on Park Ji Sung whilst watching the game. This game was genuinely scoreless at half time, Japan having looked the better side but without really creating anything of note. The second half was a bit better with both teams getting forward a little more but again without looking as if they could create something to break the deadlock. If a goal was going to come it looked likely to be as a consequence of a Korean defensive mistake, but they rode their luck and the game finished 0-0. They didn't score from this corner. The subway was just as busy on the way out and I resorted to heading in the wrong direction and looping around to beat the queues. That’s it now for the national team until the Asian Cup in Qatar in January. There isn’t much of a buzz about them under their new coach Cho Kwang Rae, who whilst he seems to know exactly the sort of football he wants to play, doesn’t appear to have yet managed to make it work. 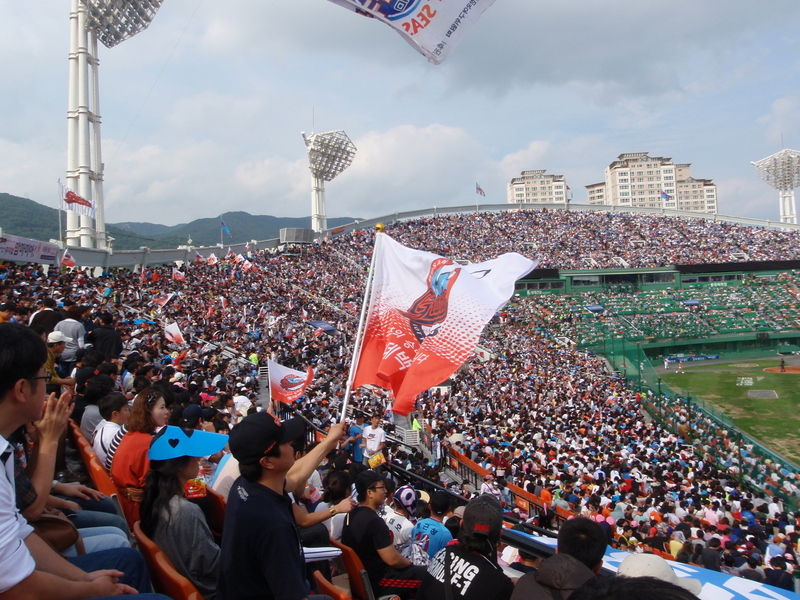 The previous weekend I’d been down to Busan to watch Doosan Bears take on Lotte Giants in the fourth game of the first play-off series. 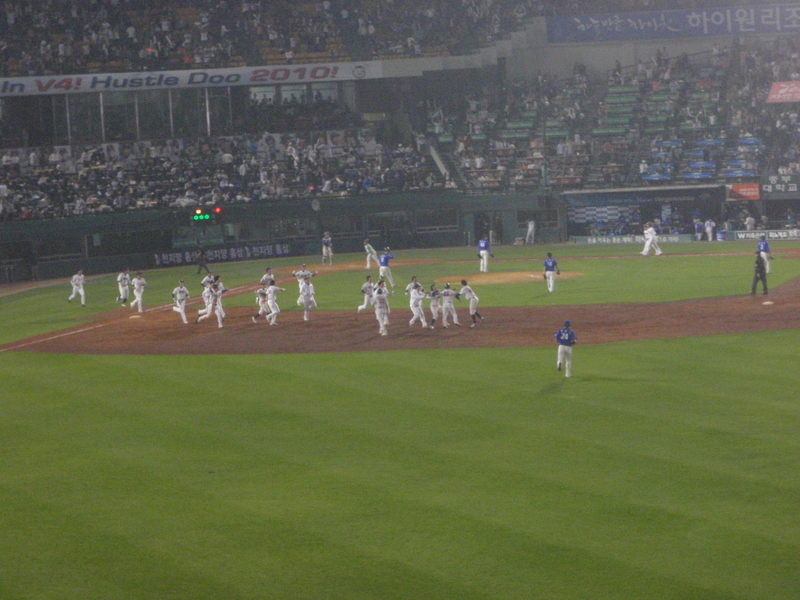 Doosan had won that game to square the series at two games each before subsequently winning the decider to progress to the next round of games, this time with regular season runners-up Samsung Lions. 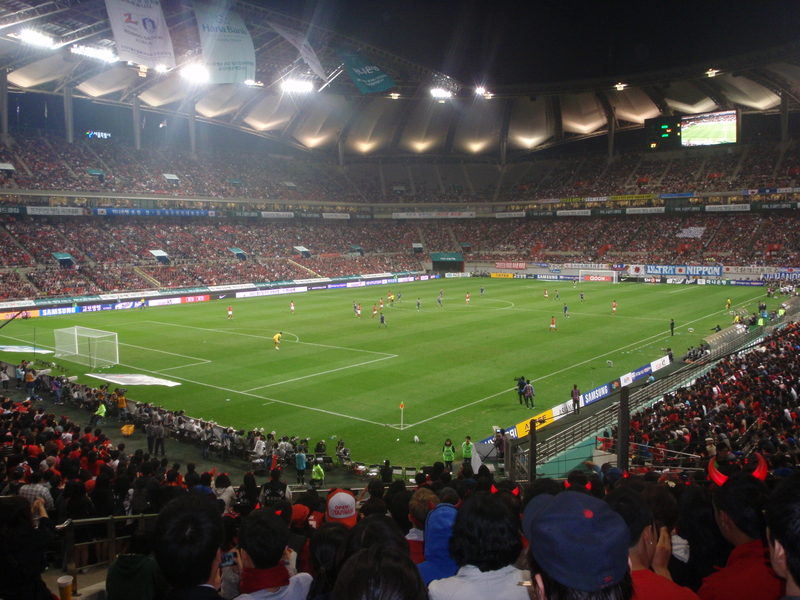 This game was the third of that five match series and the first to take place at Doosan’s home Jamsil stadium. 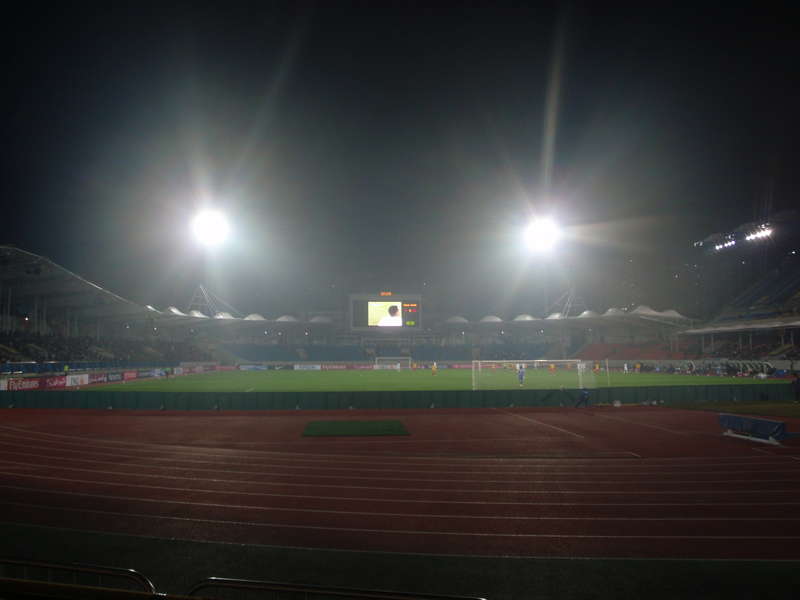 I woke up that morning nearly four hundred kilometres away in Ulsan, where I’d been watching Lee Dong Gook playing for Jeonbuk the evening before. It’s a five hour journey or so back to Seoul which meant another early start. 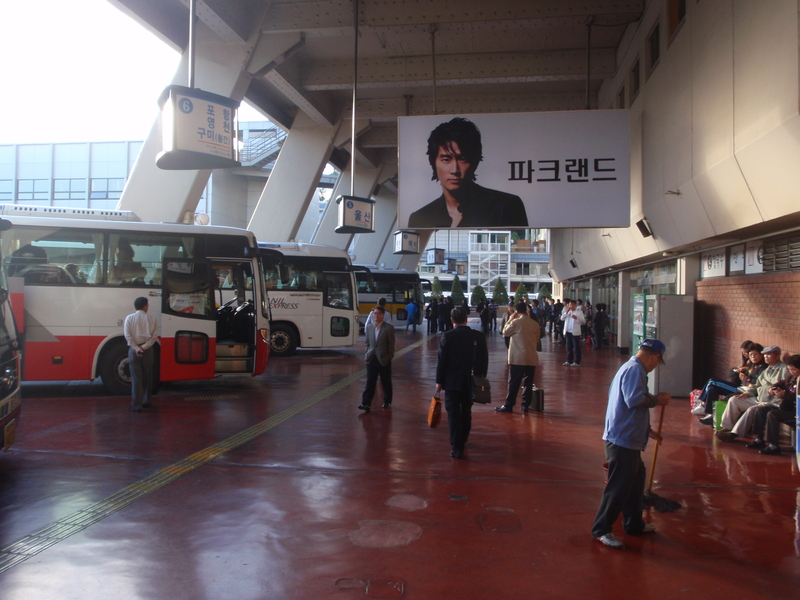 I was at the Ulsan Express Bus Terminal by about ten to six in the morning, looking to get a ticket on the first available luxury bus. Whilst the first normal bus went at six, I had to wait until twenty past for one with the more comfortable seating. I whiled away the time watching the sun come up outside the front entrance. Five hours later I was back in Seoul and a couple of hours after that I met up with Jen outside the Jamsil stadium. It was busier than I’d ever seen it before with fewer touts selling and with lots of people holding up notices stating that they were looking for tickets. Everyone was looking to buy, rather than sell. 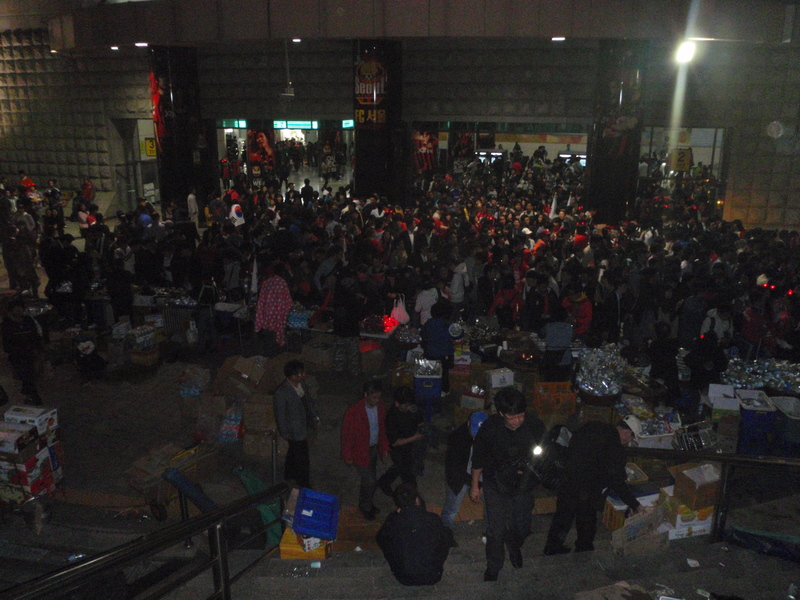 We wandered around for a while near the ticket office but as nobody seemed to be selling any tickets we had to head back down the steps against the flow of the crowd into the subway where I’d seen a couple of touts as I arrived. 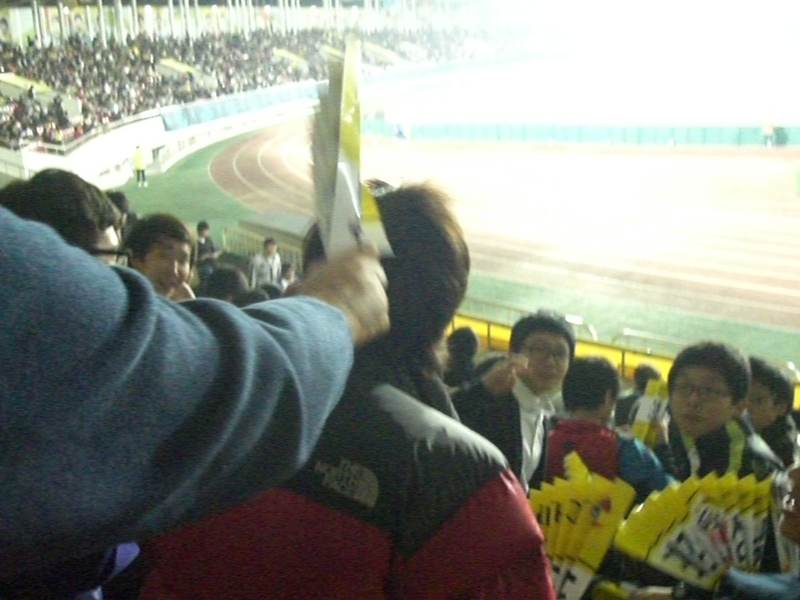 We found one and after he made a big fuss of trying to conduct the deal out of sight we got a couple of 15,000 won outfield tickets for 50,000 won apiece. Whilst that seems expensive by Korean baseball standards, it’s still only twenty-eight quid which is about what I’d have to pay to watch the Boro back home. With our current form, the baseball seemed like better value even at the inflated rates. 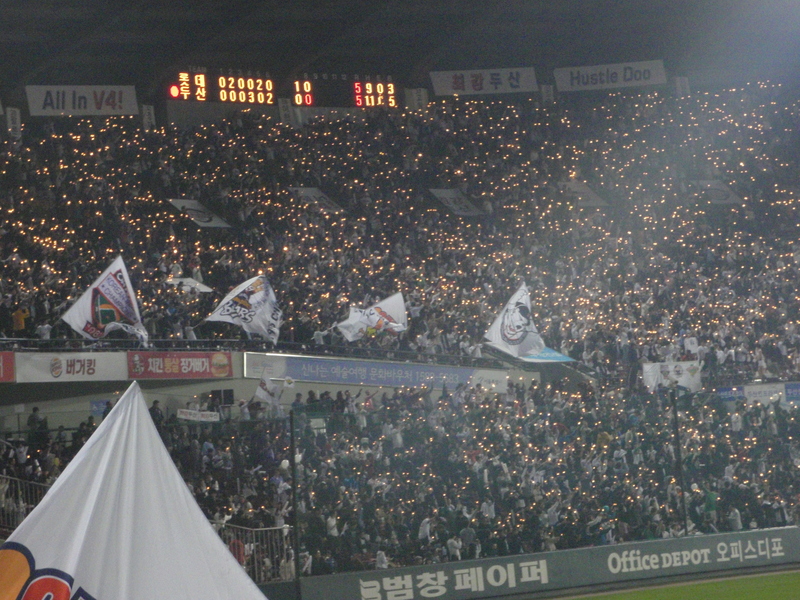 The first two matches in the play-off had been shared, with Doosan winning the previous game two days earlier. Jen and I had watched the end of that match on Friday night in a bar in Gangnam. Earlier that evening we’d paid a visit to a coffee shop. Nothing remarkable about that, I hear you say, apart from the notion of me actually being in a coffee shop on a Friday night. Or any night, come to think of it. This was no ordinary coffee shop though. This coffee shop had a Doctor Fish section. For those of you unfamiliar with this particular facility, it consists of a couple of fish tanks that are sunk into a platform. When you have swilled down the last of your fancy cat droppings latte, you can remove your shoes and socks and after washing your feet, dangle them into one of the fish tanks. The fish then nibble away at your feet, removing surplus bits of dead skin, but leaving useful stuff like toes. I don’t know if the fish are specially trained or if it’s just instinctive, but they seem to know exactly what they are supposed to do without any prompting. Why else would you go to a coffee shop? We tried the tank with the small fish in first. These were about an inch long and reminded me a bit of whitebait. I kept that to myself though as the tables were turned tonight and I didn’t want any of them to nip me a little bit harder than normal in revenge. 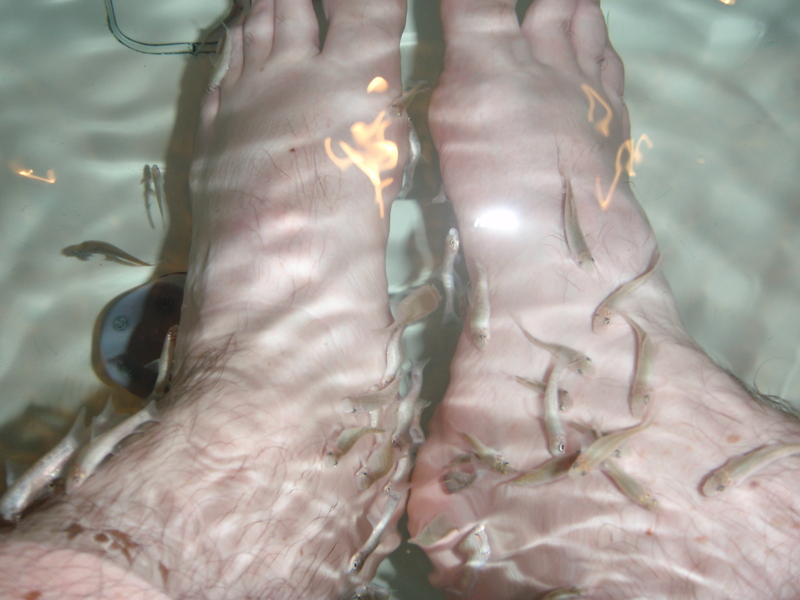 I’m not sure if our feet had more dead skin than normal or whether the fish hadn’t been fed that day but we soon had about twenty of the small fish getting stuck in to each foot. 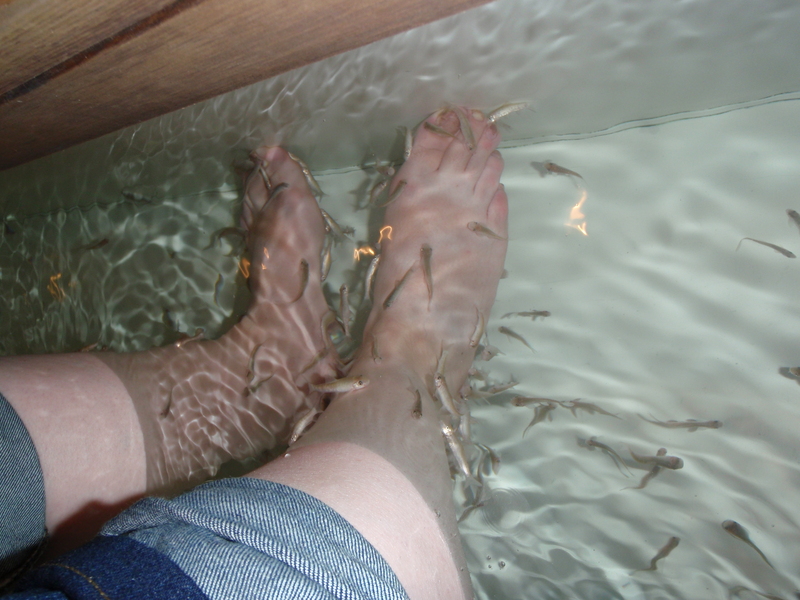 It was a mildly ticklish experience, probably a bit more enjoyable for us than it was for the fish. They seem to like the slightly less hairy legs too. Good as it was though, it was just delaying the encounter with the bigger fish. I shuffled across from one tank to the other and had a look. These fish must have averaged about three inches long and they returned my gaze, rising to the surface and opening and shutting their mouths like babies anticipating their bottles. I sat there for a couple of minutes, teasing them by lowering one foot towards the water. Eventually, mainly because it would have been too embarrassing not to, I plunged a foot into the water. Whilst the small fish had been a bit peckish, this lot were ravenous and the water bubbled as if they were piranhas being fed pork pies. I've caught smaller fish with a rod. I used to have a tank of piranhas. When I got married the first two items I bought for the house were a dishwasher and a tank of piranhas. It’s no wonder that in the brief time we were together I was never trusted to go to the shops alone again. Anyway, one day the thermostat on the heater failed and the change in the water temperature caused the piranhas to turn on each other. As soon as one looked a bit weak, the others would attack it until eventually just one piranha remained. I think he died later in the day, probably from overeating. Anyway, the good news was that the creatures nibbling my feet in the coffee shop weren’t piranhas. They could give you a decent nip with their gums though and the effect of about thirty of them fighting over the skin on my feet was a curious sensation. It was quite ticklish but was accompanied with a sense of apprehension that one of them might just get carried away and take a toe off. After about twenty minutes we reckoned that it was probably time to move on, whilst we could still walk. 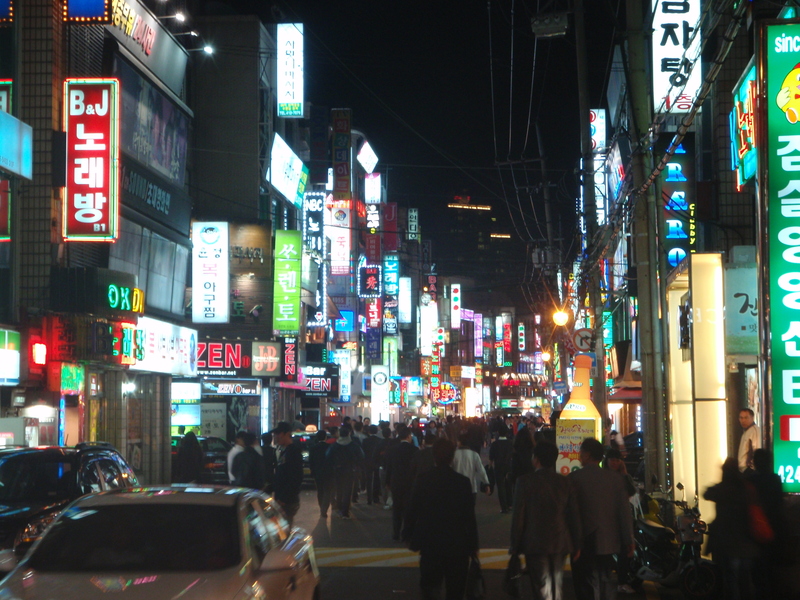 My feet did tingle a little as we walked through the streets of Gangnam, no doubt smarting from the thousands of tiny bites that had just been inflicted. I’d recommend it though as a reason to visit a coffee shop. Even on a Friday night. 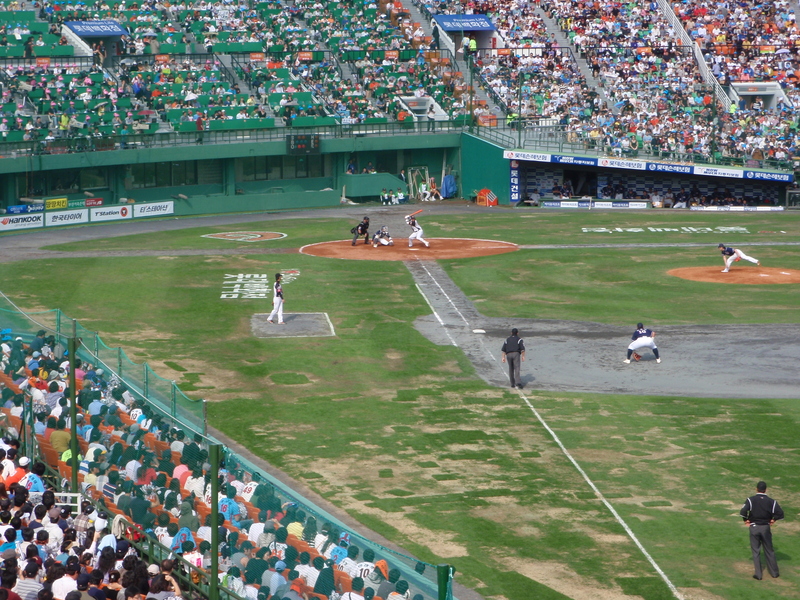 So, back to the Sunday and the third game between Doosan and Samsung. 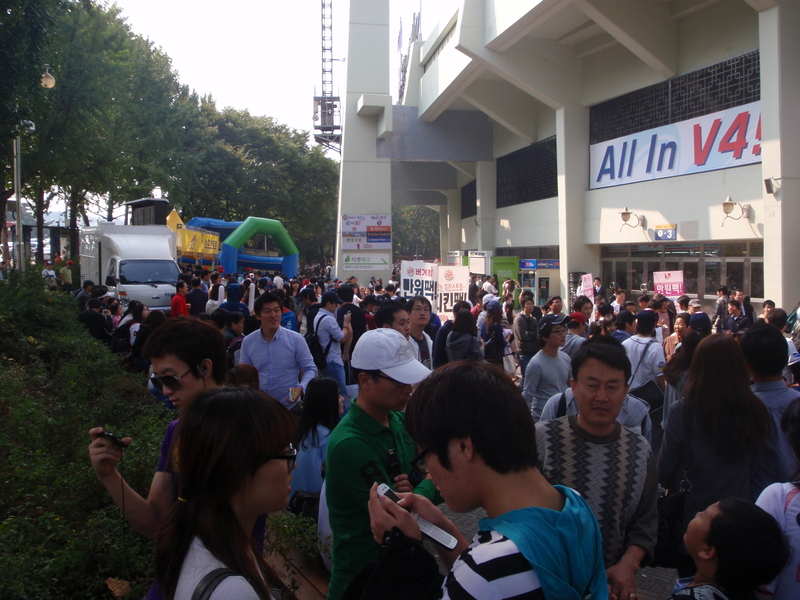 There were still around twenty minutes to the start when we made our way inside, but the outfield was just about full. 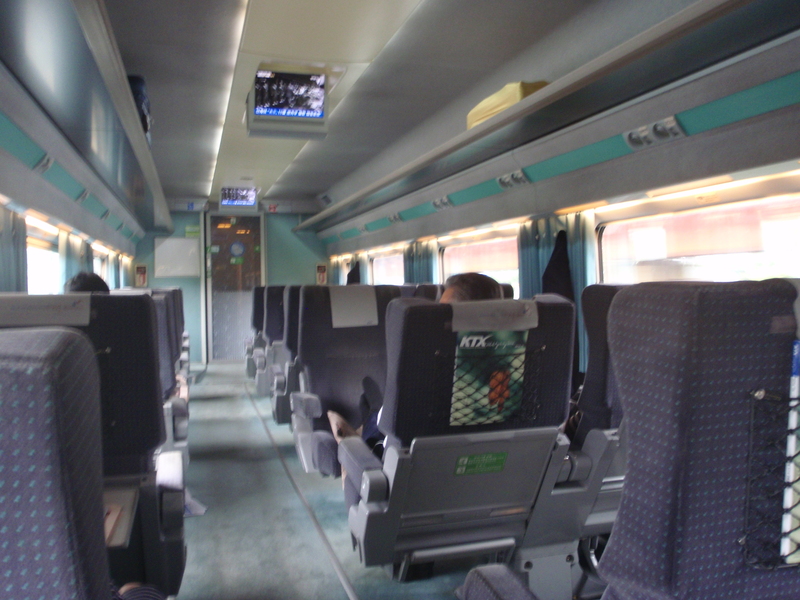 Even the seats that had nobody sat in them had been reserved with coats, scarves and bags of food and drink. 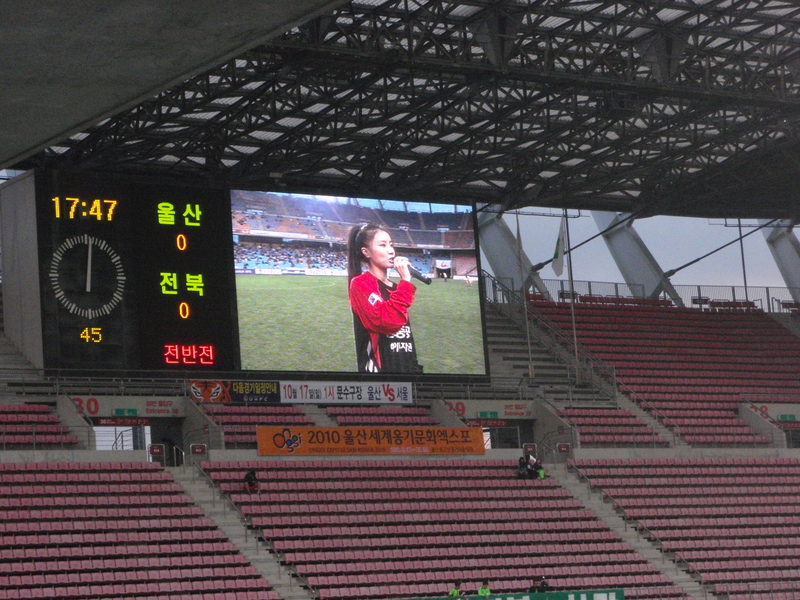 Eventually we found two together towards the back on the Doosan side of the scoreboard. There was still plenty of space in the reserved seats section of the main stand, in fact some of those seats remained empty for the entire game despite it being a sellout. 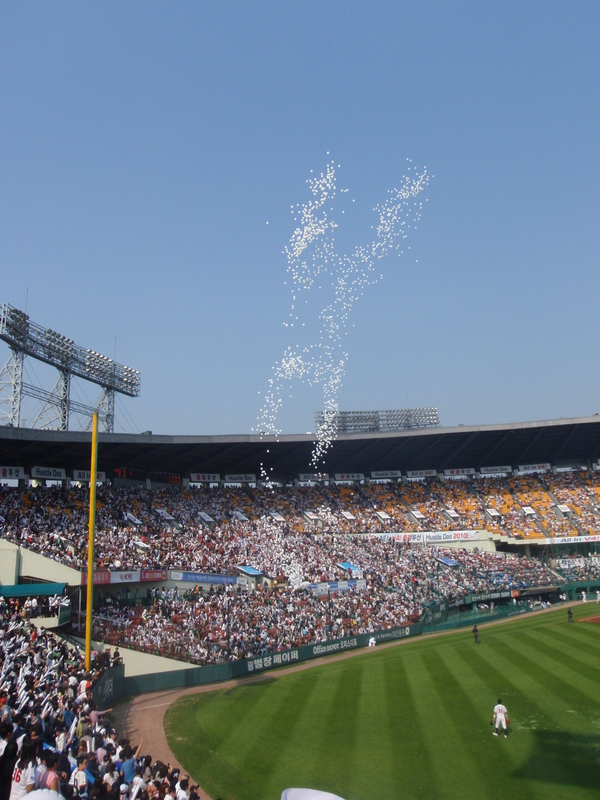 As the game started the Doosan fans released a few hundred white balloons into the air. I’d seen this done at a football game recently where the rain drove the balloons back down again and the ref had to stop the game for players to pop them. The weather was better today though and they safely floated up and away towards the flight path into Incheon Airport. 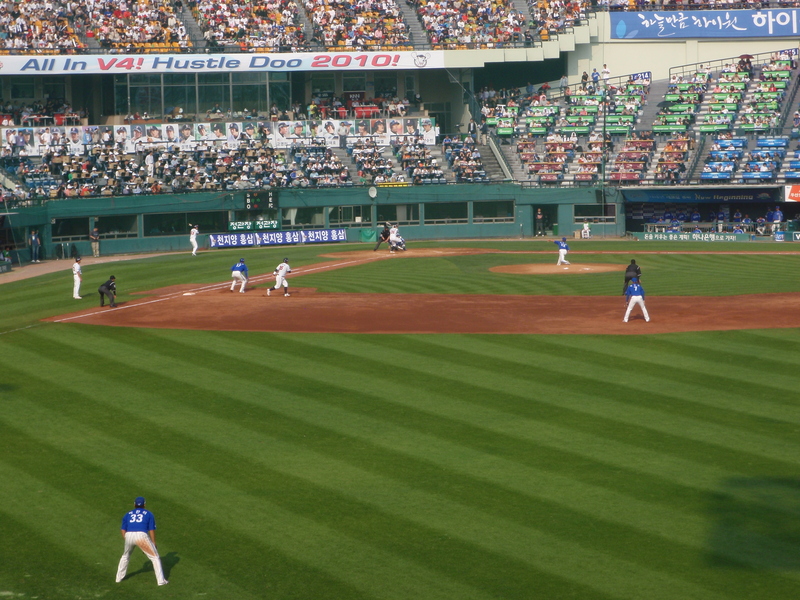 Samsung struck first and went 3-0 up in their first innings, their early dominance causing the Doosan starting pitcher to get hooked early in the second with the score having moved to 4-0. 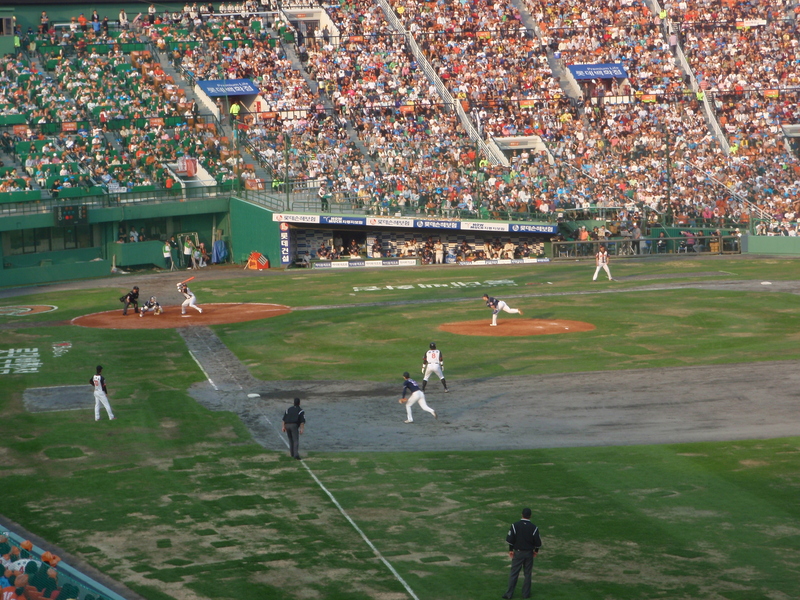 Doosan Bears batting, Samsung Lions fielding. 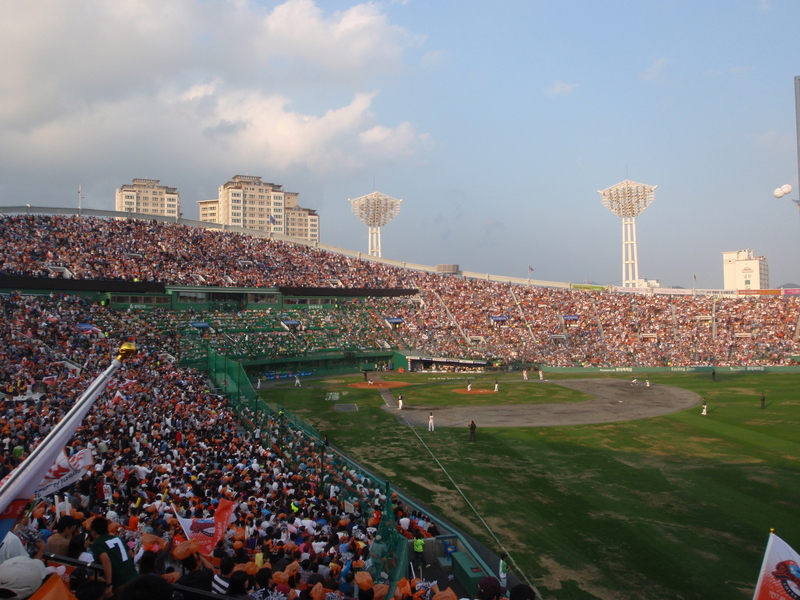 Doosan fought back though and by the fourth innings they had turned the early deficit into a 5-4 lead, which gave their fans something to get excited about. A further run in the sixth innings took it to 6-4. Samsung drew level at six all in the eighth with two runs including a single homer from pinch hitter Cho Yeong Hoon. 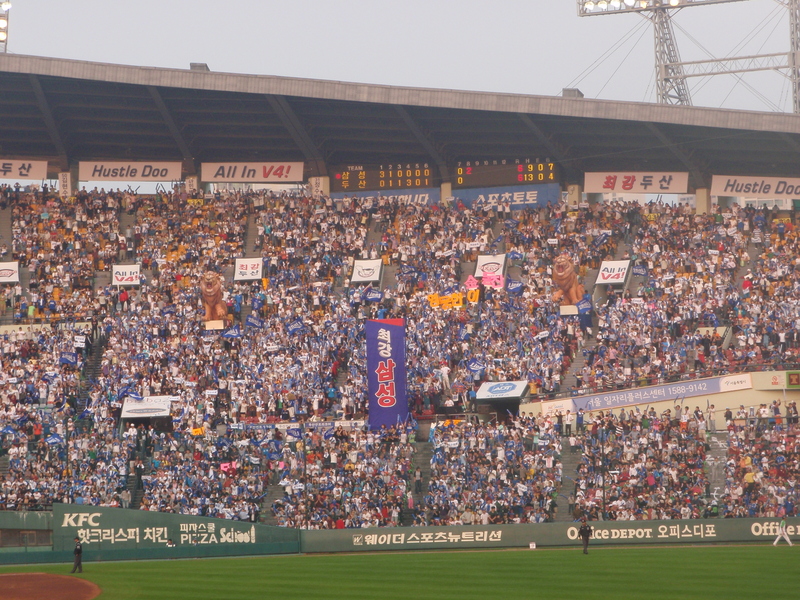 The Samsung fans weren’t as numerous or as vocal as the Lotte Giants fans had been in first play-off series, but they did have two sizeable inflatable lions to help compensate. 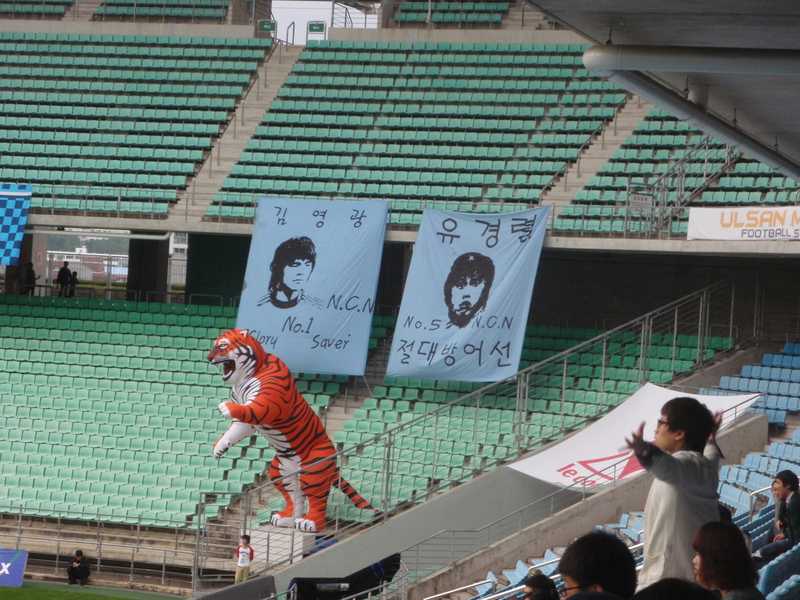 Even better than the inflatable tiger at Ulsan. Whilst the Doosan fans might not have had inflatable lions they did have lots of balloons left over from their grand gesture at the start which were distributed for a display that didn’t quite match the one they had done with sparklers the previous week. They also made good use of those inflatable sticks that you bang together. Not quite as good as having two inflatable lions. Doosan had plenty of opportunities to clinch the game in the ninth but didn’t take them and we were into overtime. I’m guessing that’s what they call it anyway. The teams play up to three additional innings to try to separate them. What happens if they are still level after twelve I don’t know. Perhaps the team with the best inflatables wins. I was amazed at how many people were leaving as the extras innings were being played. This wasn’t some meaningless end of regular season game but the playoffs. 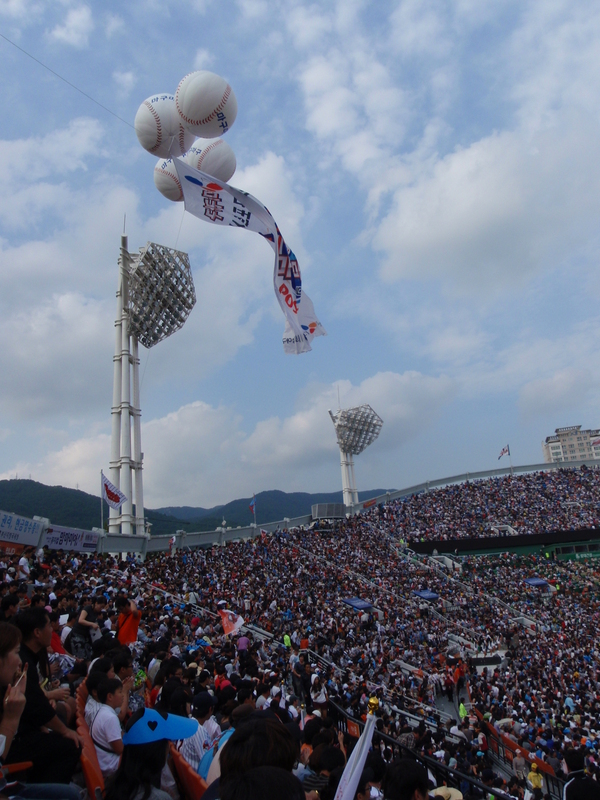 It was getting close to seven o’clock when after a scoreless tenth Samsung scored two runs in the eleventh, followed by a game winning three from Doosan Bears for a 9-8 win and a 2-1 series lead. The lions were deflated and packed away, the remaining Doosan fans partied and we slipped away after almost five hours of a closely contested match. 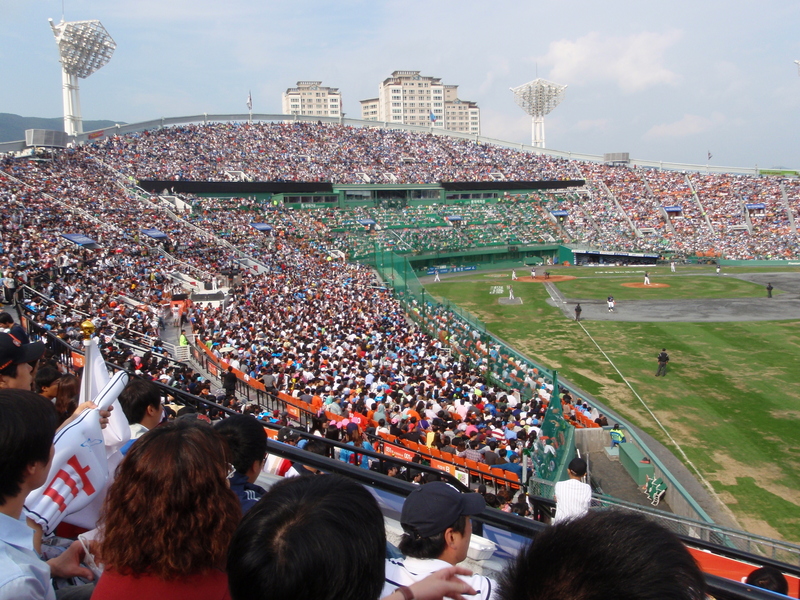 The next baseball game for me will be the second match of the Korean Series where the eventual winner of this contest will take on SK Wyverns at their Munhak Stadium next Saturday. On Saturday I travelled down to the south of the country for the second weekend in a row. 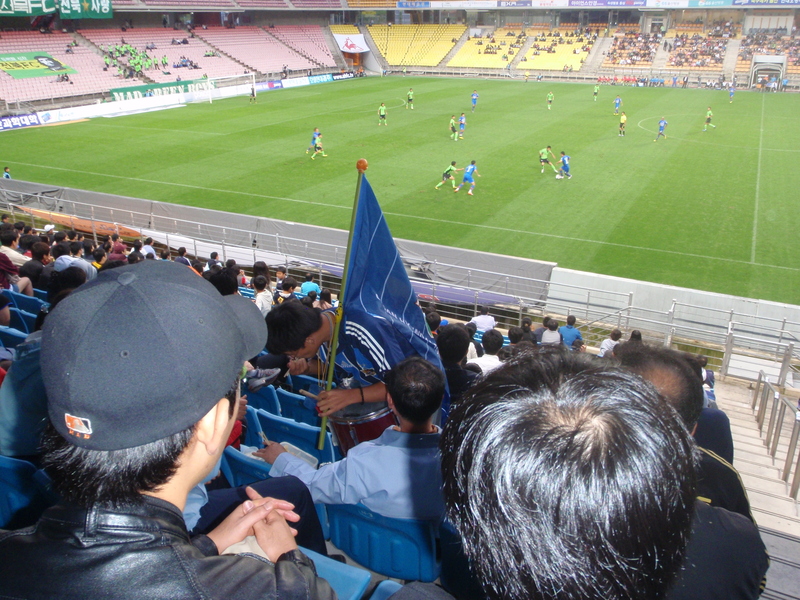 This time though it was to Ulsan where the home side Ulsan Horang-i were taking on Lee Dong Gook’s Jeonbuk Motors. 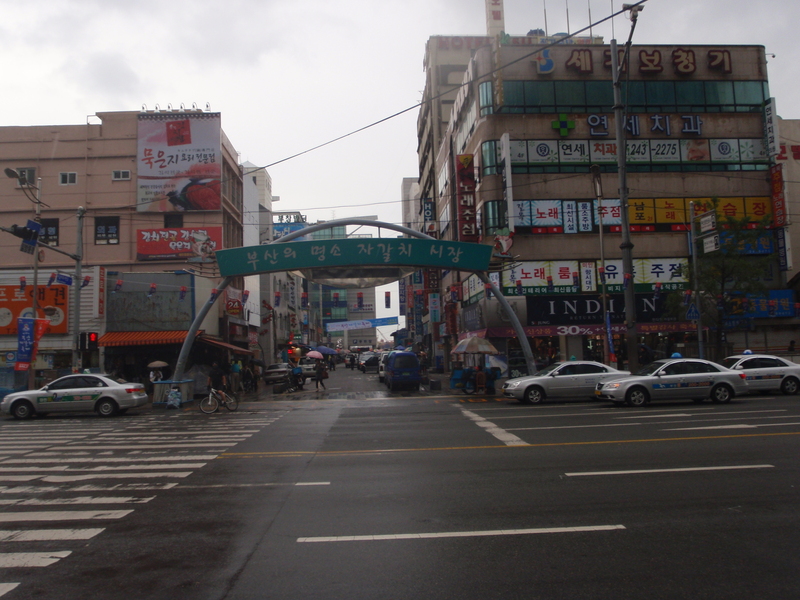 I was up early and by about quarter to eight I was already at Seoul Express Bus Terminal where I bought a ticket to Ulsan on the 8am ‘Deluxe’ bus for 29,300 won. Deluxe means that the bus only has about 30 seats, each of them larger than normal and arranged in a 2+1 configuration. They are pretty comfortable and recline sufficiently to allow you to easily take a nap. This was handy as the journey of almost four hundred kilometres was scheduled to last about four and a half hours. We stopped after about three hours for a break at a motorway services. I’ve no idea where we were, but it looked nice enough. 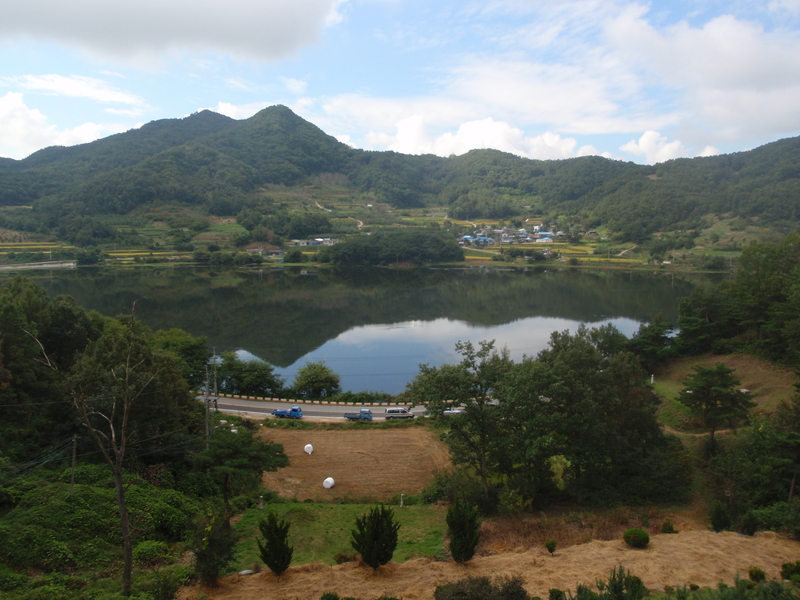 Somewhere between Seoul and Ulsan. If one of the market stalls had sold fishing rods I might have been tempted to have left the bus there and then. Another one for those with an interest in motorway service stations. 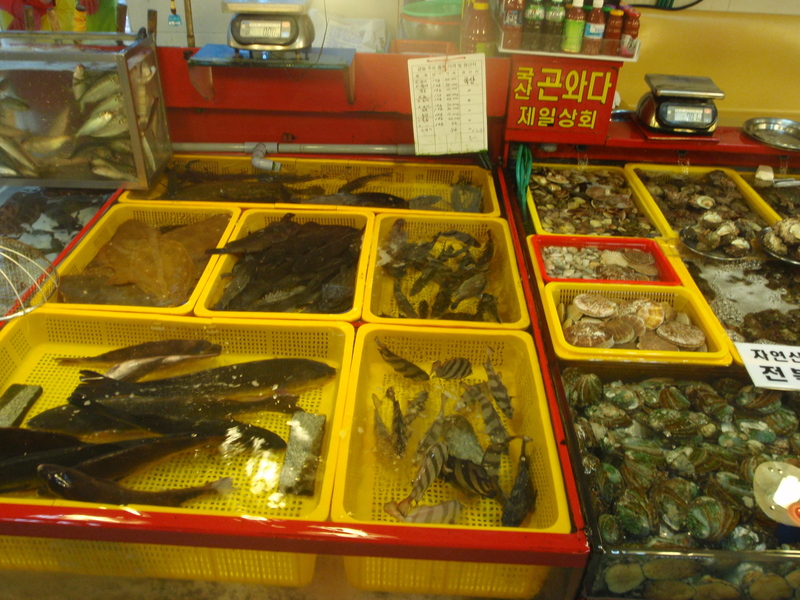 They didn’t sell fishing rods though and so I got back on the bus and just after one o’clock I arrived at the Ulsan Express Bus Terminal. 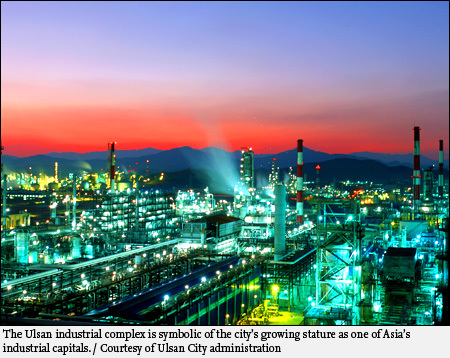 I hadn’t managed to learn very much about Ulsan before getting here. It didn’t warrant a mention in either of the Korea guide books that I have, nor did the internet throw up anything of interest. I picked up a map and some leaflets from the Tourist Information Office and learned that they have a few mountains around the edge of town that looked worth a visit. They also have a lighthouse where people often gather to watch the sunrise and they have an industrial complex that the notes on the map recommended viewing from the top of one of the hills after dark when it would be fully lit up. That place looks somewhat familiar. I liked the last suggestion, it reminded me of gazing upon Teesside from Roseberry Topping. Unfortunately I didn’t have time to climb any mountains and I was too late to see the sunrise so I just had to mentally file the knowledge for any future visit. As I had about three and a half hours to spare before the five o’clock kick-off I decided I might as well do my sightseeing on the way to the stadium. It was marked on the map that I had and looked to be a few miles away. I set off walking in the general direction, safe in the knowledge that I could always get a taxi if it turned out that the scale of the map bore no relation to the actual distance involved. There wasn’t a great deal of interest along the route although I suppose that when the Tourist Information place is giving the Industrial Complex a plug, you know that it’s not really a town geared up for visitors. I did take the opportunity to get a haircut though. It had been a month since my last one and as I had a bit of time to spare it made sense to get an overdue job out of the way. I may have mentioned before that the barber shops over here are not alway what they seem. Some are just covers for brothels, others, whilst providing haircuts, also offer a variety of ‘extras’. Or so I’m told. I think the barbers that I went into was one of the latter type. The barbers chairs were hidden behind a screen so you couldn’t see them from the street and once in the door there was a small reception area where the barber, a couple of old blokes and a glamorously dressed women in her mid-thirties were sitting watching golf on the telly. I did my usual mime of shaving my head and the barber directed me to behind the screen. In the back area there were three barbers chairs set out in front of mirrors and then behind them were three single beds. The odd thing was that there was nothing dividing the chairs from the beds or the beds from each other. If a customer wanted the glamorous woman to break off from the golf and fiddle with his bits, it would be in full view of anyone on the next bed or in the barbers chairs. I like to think I’m fairly worldly-wise but I’m not sure I’d be too keen on someone, perhaps my next door neighbour, sitting down for a short back and sides whilst I was getting jiggy with the staff, six feet away and in full view. Anyway, the option didn’t arise and neither did anything else. Perhaps they realised I was just after a haircut or maybe the golf was at a particularly critical stage. Nobody else turned up in the ten minutes or so it took to give me a trim, so I didnt get a live show included in the price either. About two and a half hours after setting off from the bus station I got my first glimpse of the stadium. Or at least its roof, with the rest of it hidden behind trees. It is right in the middle of a very picturesque park, complete with a boating lake. I had a wander around, as I tend to do and took a few photos. 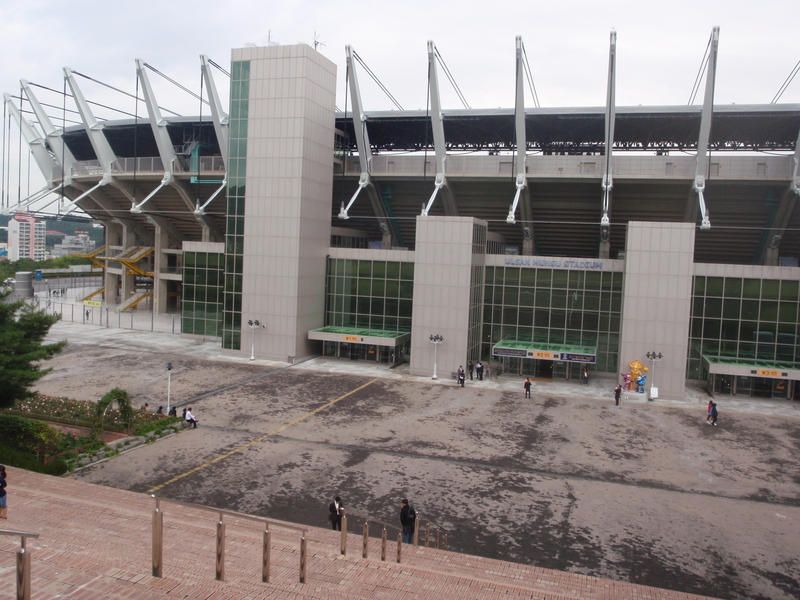 It was an impressive looking stadium from the outside, another of those built for the 2002 World Cup. 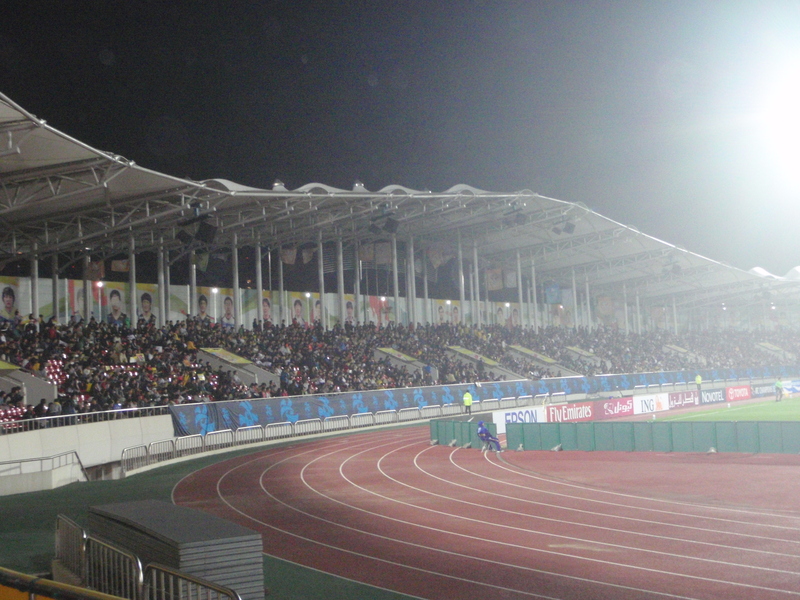 It has a forty four thousand capacity and hosted the Germany v USA quarter final if you can remember that far back. I bought a ticket for the East Stand, which faced the tunnel, and went in. I was pleased to see that it didn’t have a running track like so many of the stadiums over here and after getting a couple of cans of Hite I took a seat in the back row of the lower tier, bang on the halfway line. Kim Young Kwang, the Ulsan goalie seemed very popular. There was a lot of footage of him on the big screen before the players came out, although it did seem to include a fair few fumbles, which left me questioning both his competence and that of the bloke who put the video together. The fans liked him though, he had his own banner behind the goal next to a large inflatable tiger and he got the biggest cheer of the day when the teams were read out. This was a big game for both teams. Ulsan started the game in fifth position with Jeonbuk in sixth, three points behind and in the final play-off position, but seven points clear of the next team Suwon. A win for Ulsan would just about make them safe and would give Suwon a bit of hope in their chase for sixth position, whilst a win for Jeonbuk would just about finish Suwon’s season. Lee Dong Gook had been restored to the starting line-up after his substitute appearance the previous week as Jeonbuk went with the wing backs again, with Eninho playing just off the Lion King. 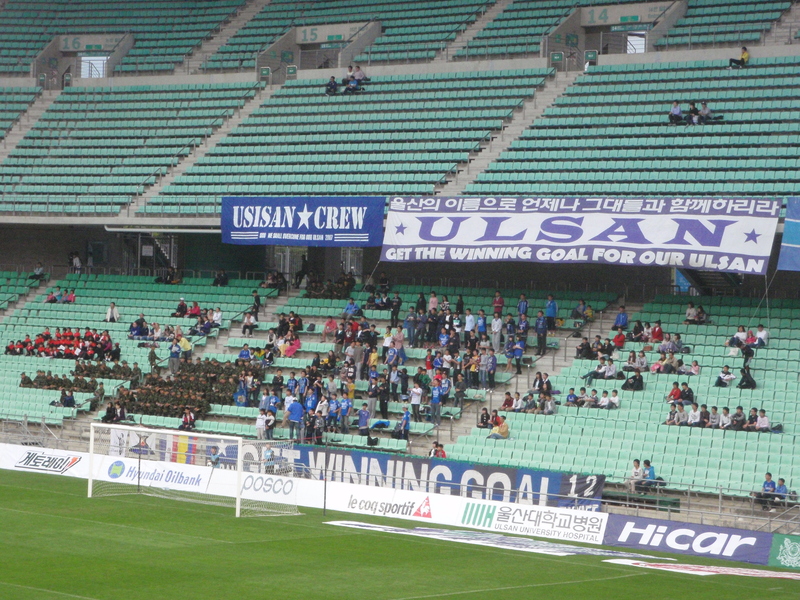 A few minutes into the game about fifty soldiers joined the hundred or so Ulsan fans behind the goal. Just in case North Korea gets a bit arsey. 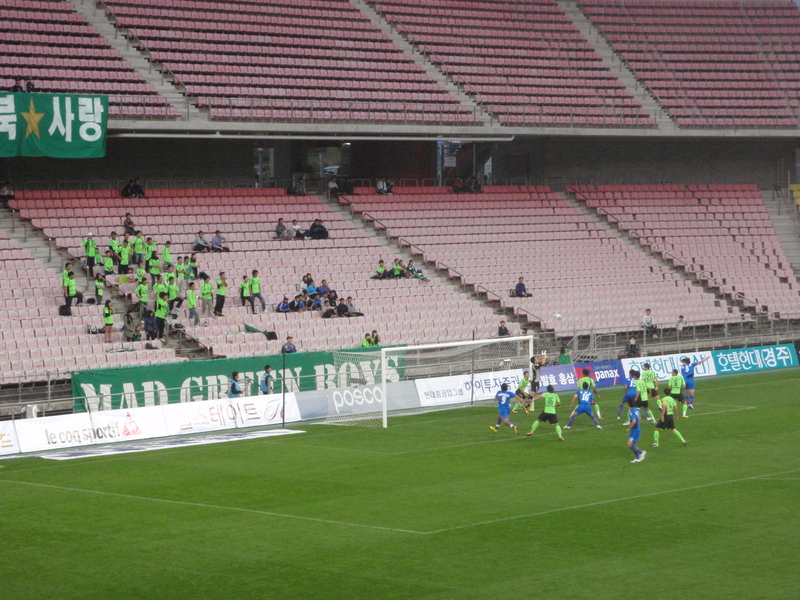 Jeonbuk didn’t bring as many fans as usual with them with only about fifty of their supporters grouped behind the opposite goal. It has just occurred to me that these reports could be a lot more accurate than they actually are. When there are only around fifty fans in a stand it shouldnt be beyond me to count them and tell you exactly how many there are. I’ll try it next game. I might even try counting the exact crowd just to see if I can do it. In fact at some of the lower league games I could probably get you a list of all their names. Anyway, Jeonbuk started well and Lee Dong Gook had a chance in the first few minutes that looked offside to me but it didn’t matter as he shot straight at the keeper. No doubt the save will be on the highlights reel before next weeks game. 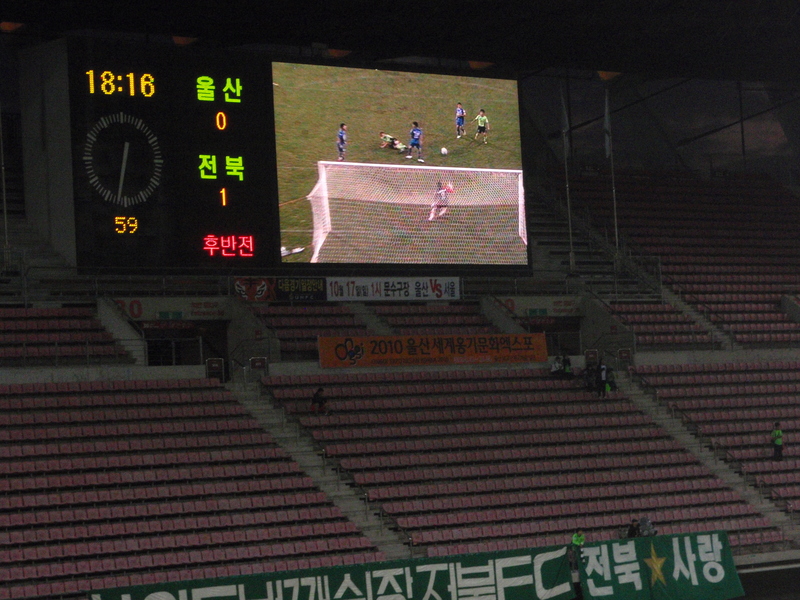 A few minutes later Ulsan nearly scored from a corner when Yoo Kyoung Youl headed over the Jeonbuk bar. Not a great deal more seemed to happen in the first half, apart from the appearance of Flag Boy. This lad turned up about midway through and wandered about the East stand collecting food and drink from people who appeared to be strangers to him. After he’d eaten and drank as much as he wanted he went down to the front of the stand and led the singing for a while before a niggly first half drew to a close. Squid? Beer? Crisps? Thanks very much. At the interval I wandered out for a couple more cans of Hite, watched a girl wearing the home team’s goalie top sing Blondie’s Maria and then moved upstairs to see what the view was like from higher up. The second half was a bit better with Ulsan’s Columbian Julian Estivan Velez forcing the Jeonbuk goalie to make a decent save early on and Lee Dong Gook blazing over the bar from distance. Middlesbrough’s finest ever Korean ex-player made amends after an hour though when he got on the end of a cross from the left and despite not connecting properly his scissor kick bounced up into the roof of the net for the opening goal. Even better than his goal against Mansfield. Not only did the goal shake things up on the pitch but it caused a bit of a scuffle behind the goal between one of the Jeonbuk fans and a bloke who I think was a club employee, possibly part of the security team. They appeared to have a disagreement over the lighting of a flare to celebrate the goal and in a throwback to more civilised ways of going toe to toe, each of them carefully removed their jackets before trying to get stuck in. It couldn’t have been any more ‘old school’ without them incorporating pistols at dawn. As ever in these situations, plenty of others managed to keep them apart and the security man departed without making his point or collecting his jacket. He had to send in one of his less confrontational colleagues to retrieve it for him. Both teams had their chances late on, Ulsan from a free kick and Jeonbuk with a disallowed goal from Lee Dong Gook a few minutes from the end. There were no further goals though and the win took Jeonbuk into fifth place, above Ulsan on goal difference and seven points ahead of seventh placed Suwon with just four games remaining. 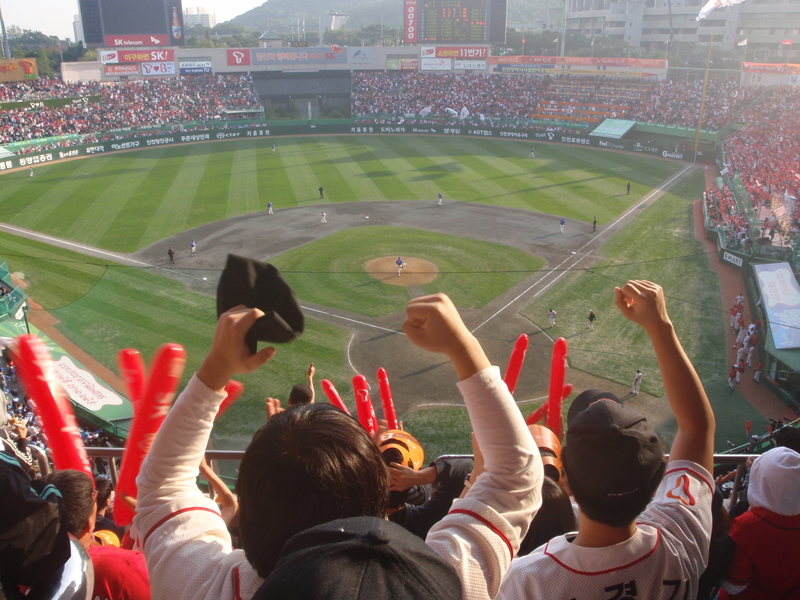 After watching Lotte Giants win away at Jamsil in the first game of the play-off series I wondered if there would be a need for a fourth game in the best of five format. 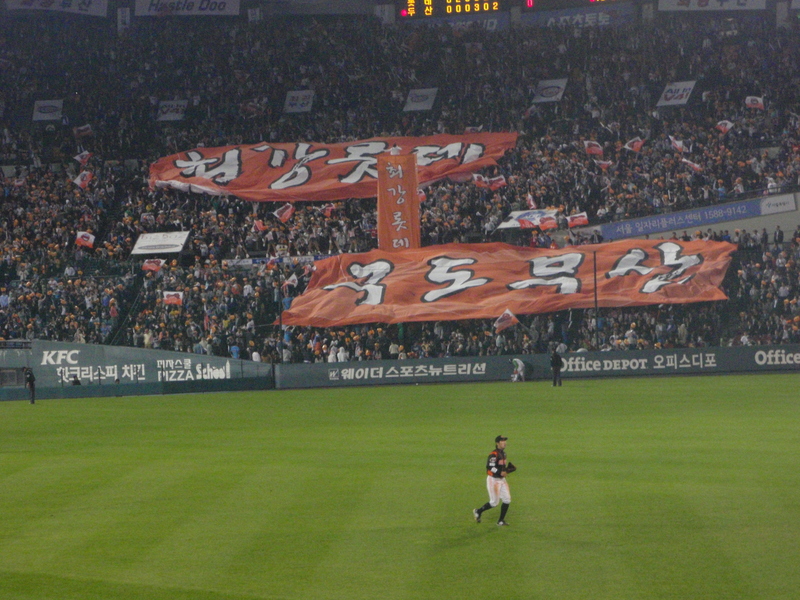 When the Giants won the second game at Jamsil as well I was fairly sure that they would round off the contest 3-0 with their first home game at Sajik on the Saturday afternoon. 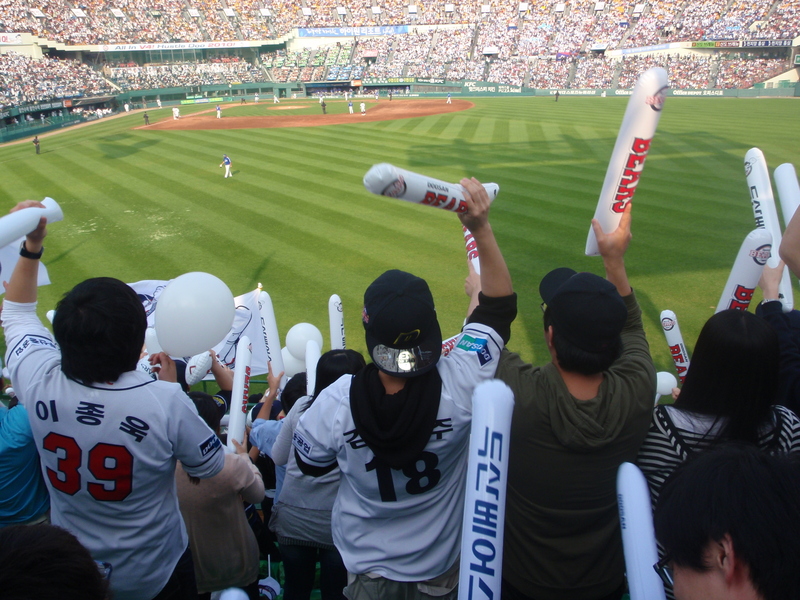 Fortunately, Doosan Bears managed to turn it around and a 6-5 away win on the Saturday brought the series score back to 2-1 and meant that a fourth game would be required after all. As all I had planned for the Sunday was going for a bike ride, I thought that I might as well get myself down to Busan instead to see a competitive game of baseball and visit a stadium and a city that I hadn’t been to so far. With a two o’clock start to the game and a journey time of just under three hours on the KTX, I wanted to set off early. 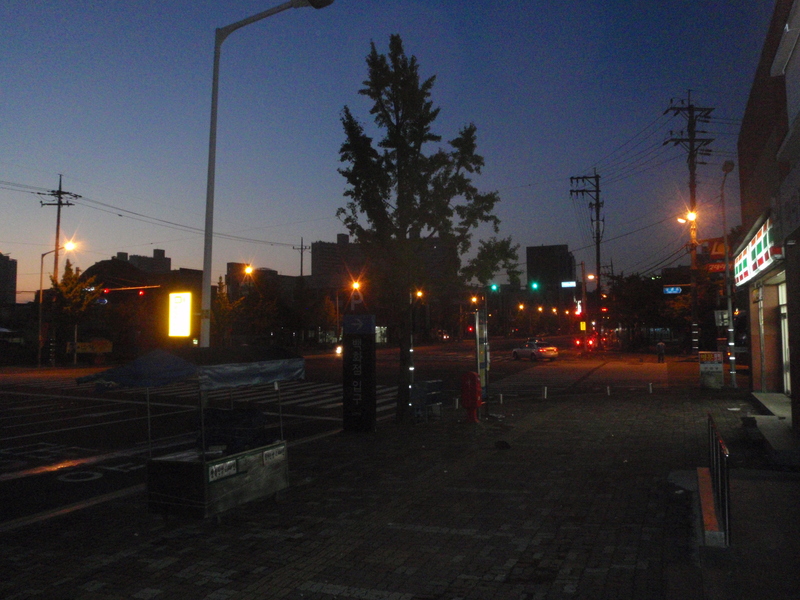 I left my apartment just after seven in the morning and was at Seoul Station for about ten minutes to eight. I quickly got a ticket for the 7.55 train and hurried towards the platform. I’d paid 71,000 for a first class ticket, the beauty being that they have single seats and I would be able to sit back and read my book in a bit of comfort. I briefly paused to get some gimbap for breakfast and then bought what I thought were sausage rolls. They weren’t of course, that would have been too much to ask for. The part that usually consists of sausage meat had been replaced with sweet potato. A similar thing happened to me a couple of weeks ago too, only it was pizza cheese that was substituted by sweet potato that time. Next week I’m planning on calling into KFC for some sweet potato wings. The train set off on time and on looking out of the window about half an hour later I could see Sunday League football matches already taking place. Playing games at half past eight in the morning wouldn’t go down too well at home. When I used to play, a large proportion of the team wouldn’t have arrived home from their night out by that time. I wasn't quick enough to photograph the footballers, so here are some orange trees instead. 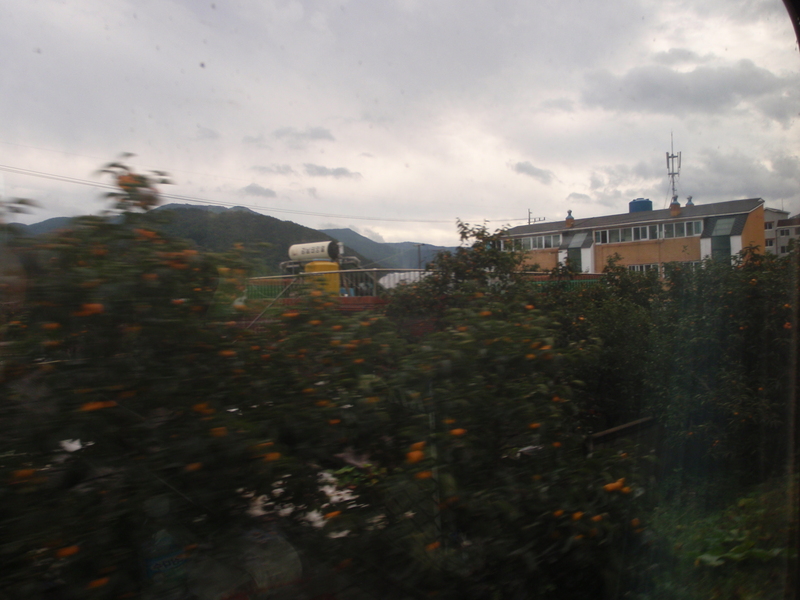 A little later in the journey I passed Cheongdo station where I’d got the train to on the way to the bull fighting back in March. I didn’t see the stadium although I’m sure we must have passed it a little earlier. 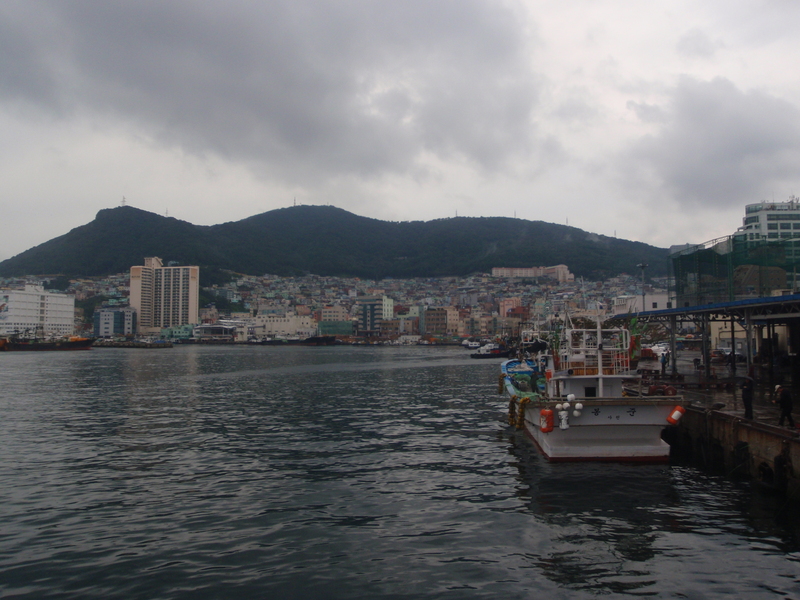 It was raining when I got to Busan just before eleven. Hopefully it would brighten up before the start of the game, I didn’t fancy having made the trip for nothing more than a chance to catch up on my reading on the train. I’d been advised to have a wander around Texas Street which was opposite the station, but with the weather being poor I decided to get a taxi to the Jagalchi Fish Market instead. The first taxi driver had no idea where I wanted to go, despite me pointing at the Fish Market on the map I’d just been given at the Tourist Information Office. The second one I tried grasped it though and ten minutes later I was there. The Fish Market is at the end of that street. 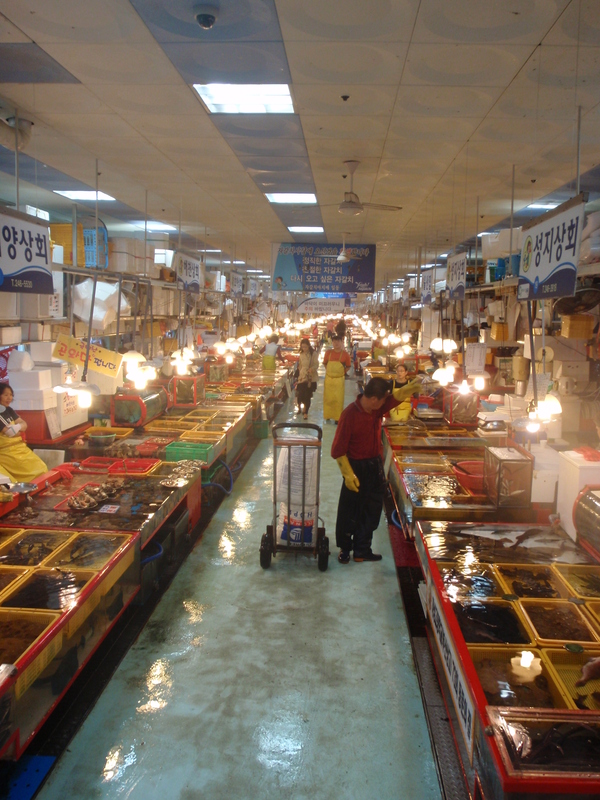 It was mostly in a large hall with lots of little stalls selling mainly live fish. They were sorted into the different species and kept in anything from buckets to tanks. Excuse me, do you sell fish? I watched a bloke pulling some from a bucket, chopping their heads off and gutting each one in the space of a couple of seconds. It was strange watching the severed heads still twitching and the headless filleted bodies flapping around on the counter for a while afterwards as he dealt with the next ones. Better than some zoos I've been to. I could have selected a live fish and taken it upstairs to be cooked for me, but it was a little early for lunch. Instead I went outside to look at the harbour and the surrounding areas. Whenever I’m somewhere like this I always have an urge to go somewhere by ship. It just seems like a better way to travel than by plane. Although I may change my opinion when it’s time to book my ticket for a fortnight at home at Christmas. 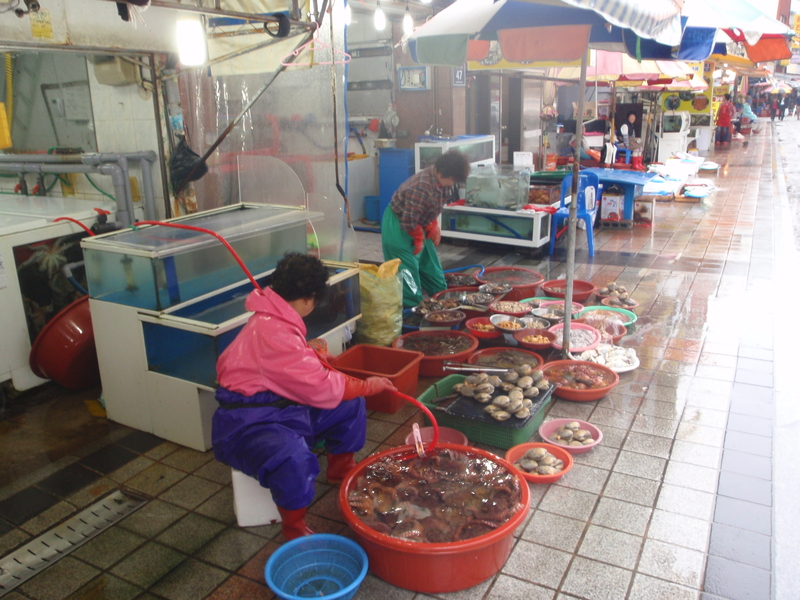 Alongside the docks were more market stalls, most of them selling a fixture of live and dead fish and some of them with a small restaurant attached. Just outside the main market building. The side dishes came first. There was some soup, which was pretty much just hot water with a few shells in the bottom, another dish contained a couple of bits of raw carrot, some raw onion, and a half a dozen monkey nuts still in their shells. The ’shrimp’ were what we call prawns in the UK and I was given about twenty of them. 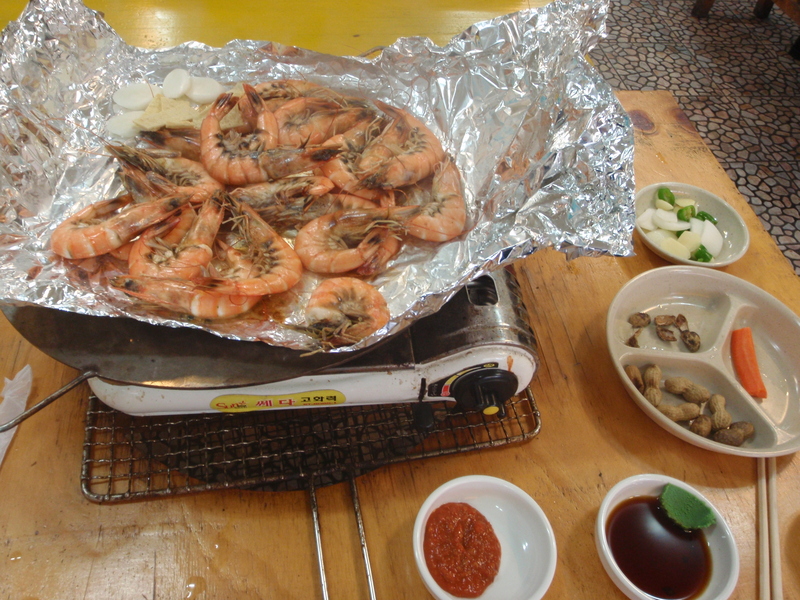 They were brought raw to my table, then wrapped in tin foil and cooked on a camping stove for a couple of minutes. They were very nice. It seemed a shame to dip them in the wasabi sauce that came with them, but that was pretty good too. It doesn't get much simpler than this. After lunch I wandered around for a bit more, watched some fisherman for a while and then had a look at the small stalls a street or so further back from the seafront. 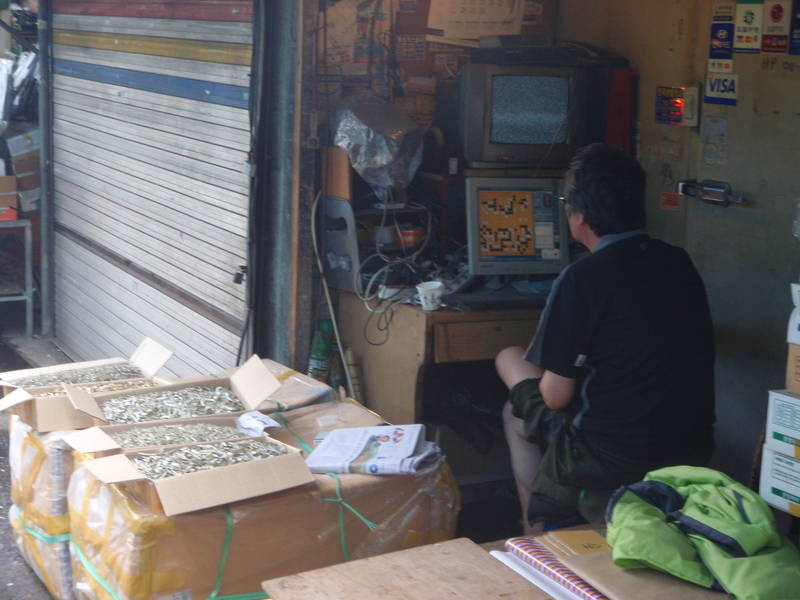 These tended to specialise in dried fish, some just in anchovies, carefully sorted into boxes by size. It wasn't a particularly busy day. By now it was quarter to one and I thought I might as well make my way up to the baseball. I got a taxi to the Sajik stadium, arriving about half an hour later. As we drew closer I could see that it was an open stadium, with a very large stand that looked to be fullish three-quarters of an hour before the start. There were plenty of people still making their way towards the stadium though and I bought a ticket from the first tout I passed. I gave him forty thousand won for a twenty thousand won ticket. That was possibly a little over the odds, but it was still only about twenty two quid and if I’d shopped around I would have been unlikely to have saved much more than a fiver. Taken on the steps on the way in to the stadium. I went straight in, despite my ticket being for an allocated seat. 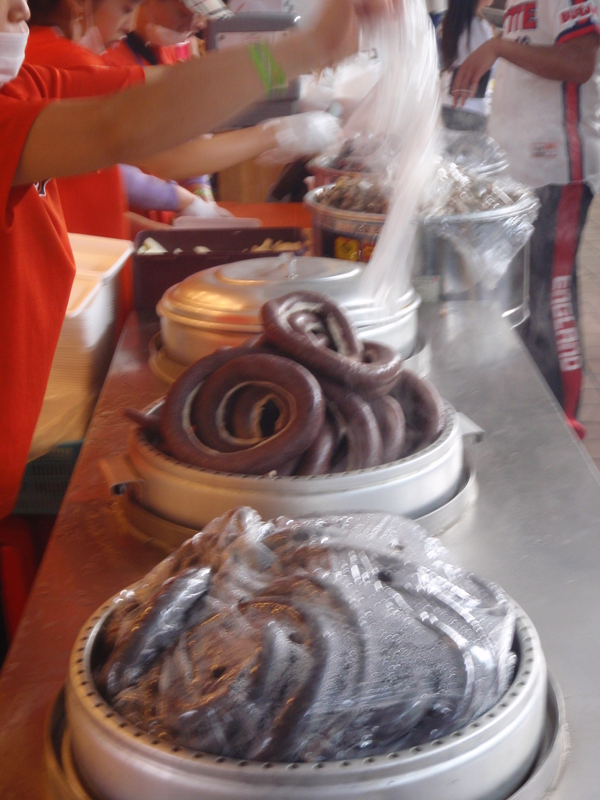 At one of the food stalls near to my section there was sausage on offer. Real sausage by the look of it, not sweet potato sausage. I’d just had my dinner though, so I reluctantly gave it a miss and I got a couple of cans of Max instead. My seat was in the Giants section, beyond first base. With half an hour to go there were still plenty of empty seats, although the unreserved seating in the outfield area was already just about full. 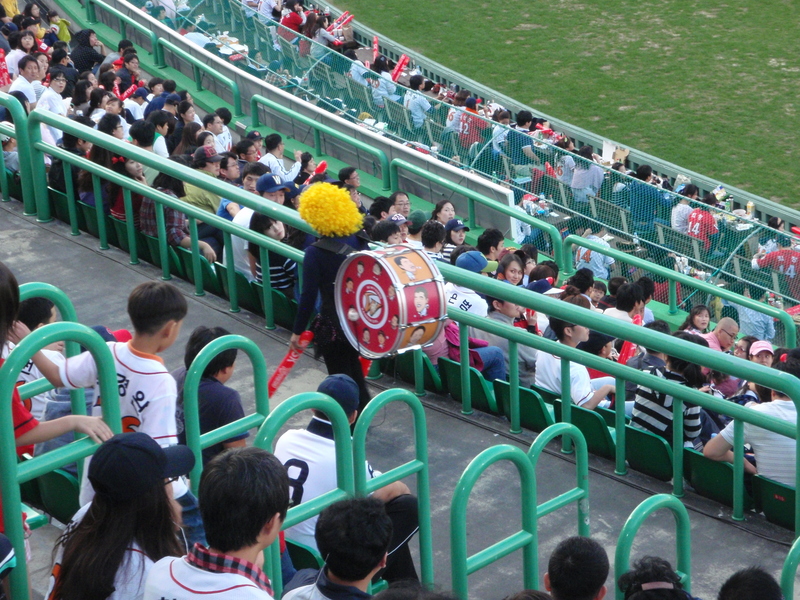 I watched the players warm up for a while as the Lotte fans took their seats around me. Most of them had either brought or were making cheerleader style pom poms out of newspaper. A club employee appeared and handed out about a dozen free large flags. 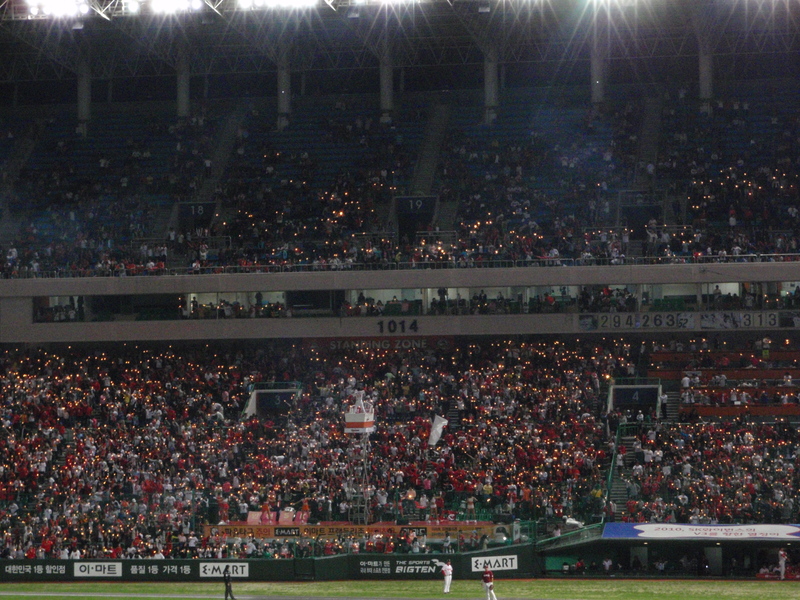 There didn’t seem to be many Doosan fans in the stadium unfortunately, which was a bit disappointing. 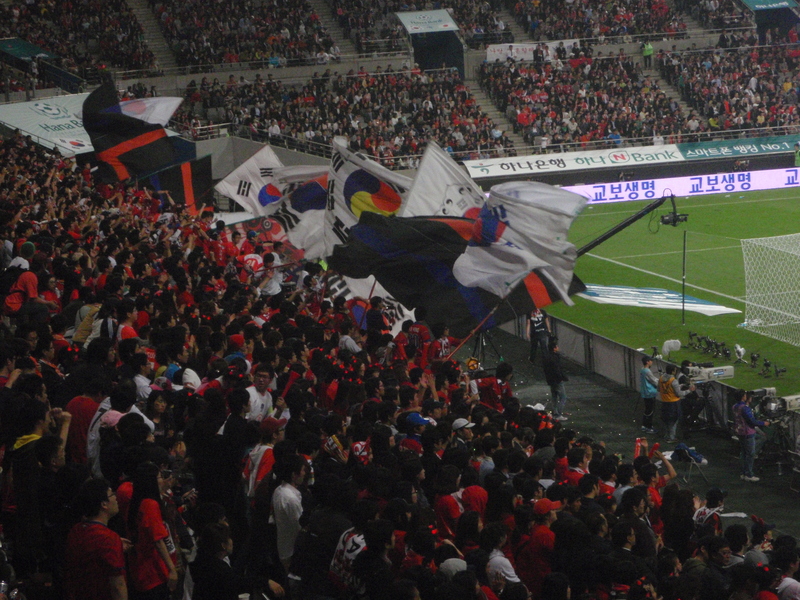 The atmosphere at the Jamsil game I’d been to four days earlier had been the best at any game I’d been to over here and the approximate fifty-fifty split in support had played a big part. There were a couple of large inflatable, well, inflatables I suppose, hanging over the stadium. There had been a bit of controversy the previous night when a ball that might have gone for a home run or may have been caught, did neither because it hit the balloon. I’d have expected one of the player’s Dads to have stuck a knife in it but both inflatables were still there, possibly on slightly longer ropes though. The ball hit the other set of balloons, but I didn't take a photo of them. The game was quite low scoring early on. 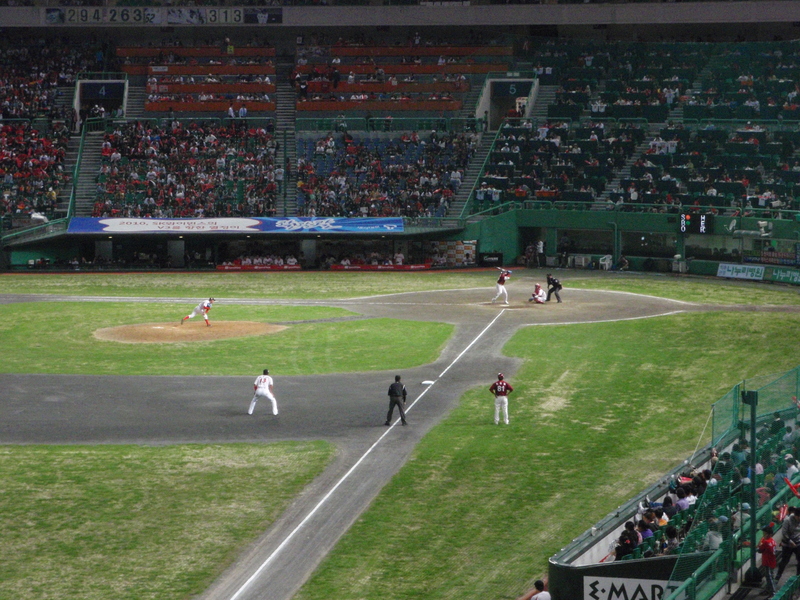 Doosan Bears took a second innings lead, before Lotte drew level at two each in the fifth. This seemed to be the signal for the Giants fans to produce the orange plastic bags that they catch the air in and tie to their ears. I’ve no idea why either, but as I was in with the Giants fans I was given a bag and joined in. I doubt I'd get away with it at Ascot. 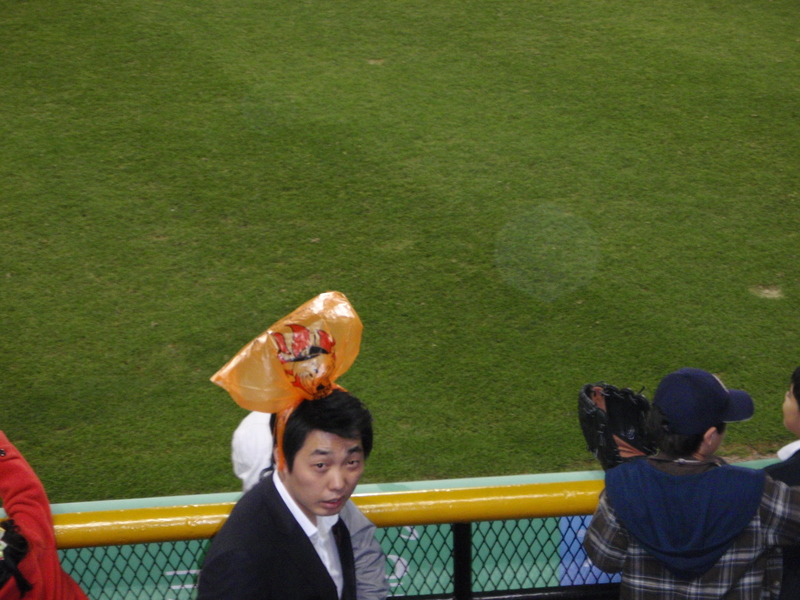 Another interesting quirk was the way that Lotte Giants substituted their pitchers. The new lad would be driven onto the pitch in a soft-top mini, perhaps to save his strength for the actual throwing. 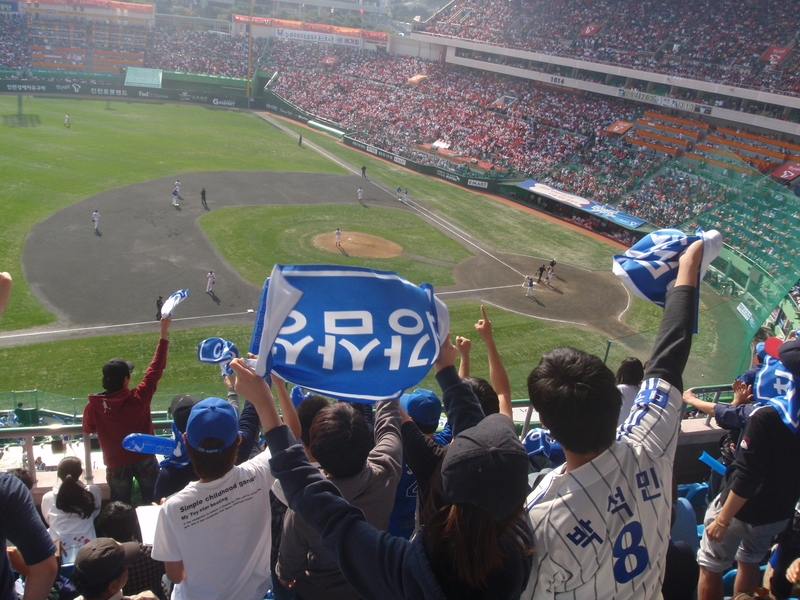 The new pitchers and the plastic bags didn’t seem to help Lotte though as Doosan took a 3-2 lead in the sixth. 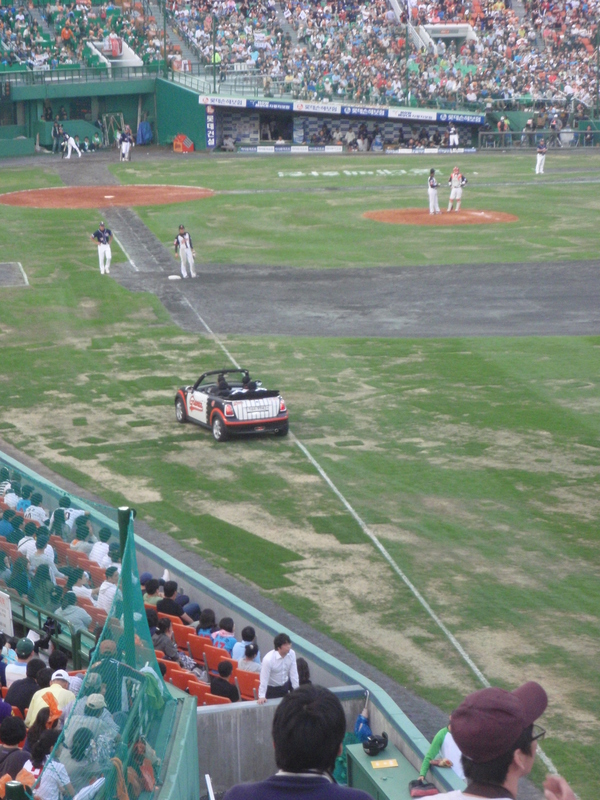 The score remained the same until the ninth innings when Doosan seemed to step up a gear and Lotte went to pieces. Jeong Su Bin whacked a three run homer that landed about five yards in front of me and then it all went a bit mad with Lotte seeming to panic a bit. With the bases loaded, one lad got walked, which meant another run and then some wild fielding enabled the Bears to put the game well out of reach with a total of eight runs in the innings for an 11-2 lead. The Giants pulled a couple of runs back in their final innings but the outcome had already been decided by that point. So, two games each, with a decider at Jamsil on Tuesday to come. 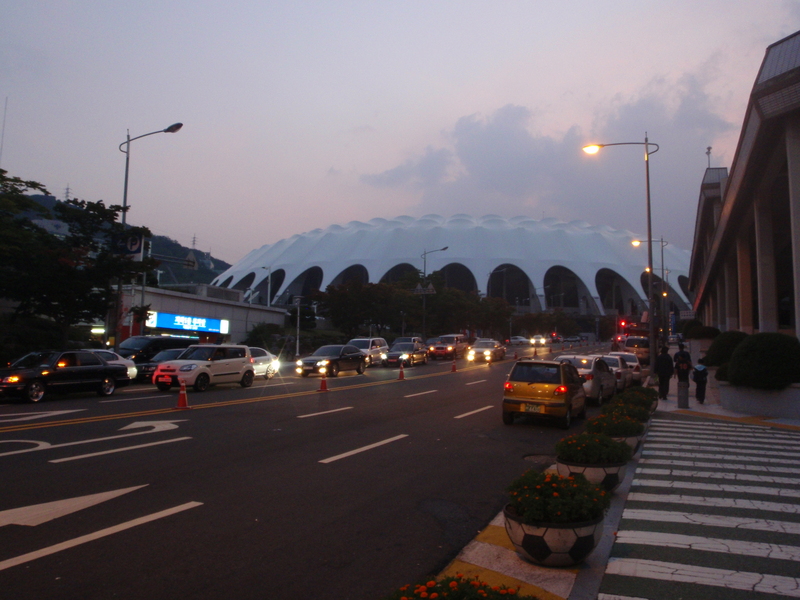 On the way out I noticed the Busan football stadium. 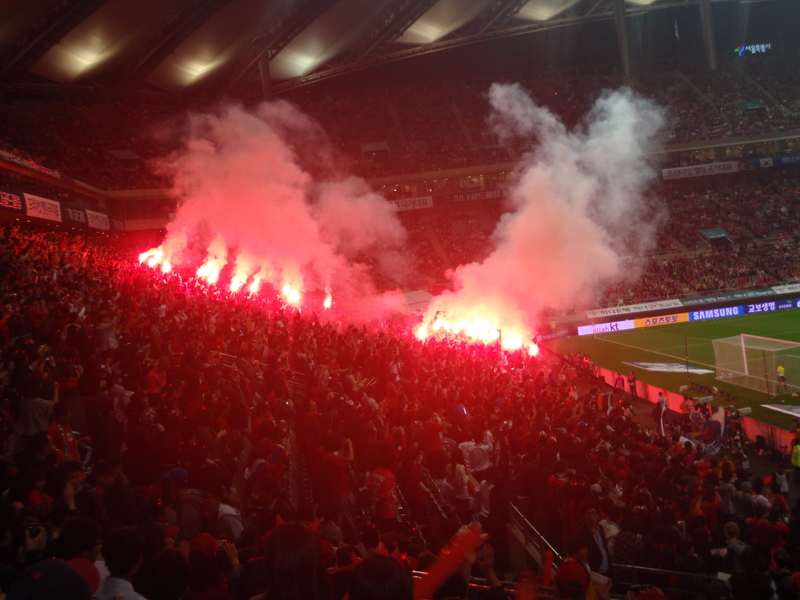 I’ll be back to take a closer look later in the month when Busan take on Suwon in the Korean FA Cup Final. I got a taxi back to the station and with half an hour to spare took the opportunity to have a look at the infamous Texas Street. It was probably more interesting after dark anyway. I was offered oysters by a bloke with a small cart and a good time by russian hookers who looked even rougher than their seafaring clients. With a train to catch I didn’t have time to take up any of the offers, nor to have a drink in the Havana club that advertised the intriguing option of ‘Spy Girls’’. More like Rosa Klebb than Tatiana Romanova, I suspect. And whilst all this had been going on Jeonbuk were limping slowly towards the playoffs. A goalless draw at home to the Army team Gwangju Sangmu was a poor result, although the point increased their lead over seventh placed Suwon to seven points as Suwon didn’t have a game. 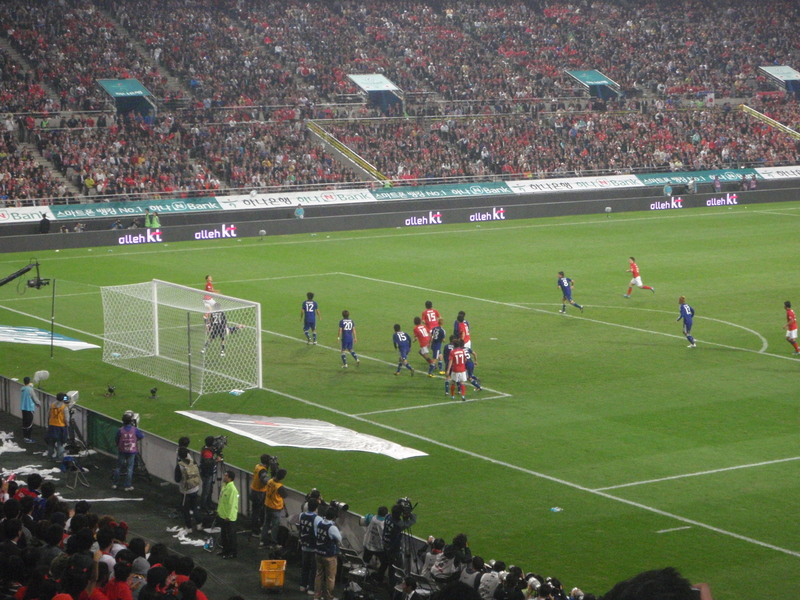 Lee Dong Gook was back in the squad after being rested with the rest of the experienced strikers the previous week. He didn’t make the team though, with the Croat Krunoslav Lovrek being preferred up front. The Lion King eventually got onto the pitch early in the second half as a substitute for Luiz Henrique. Next week Jeonbuk are away to fifth placed Ulsan Horang-i. They really could do with taking something from that game, particularly if Suwon manage to pick up three points themselves from their home fixture with Chunnam Dragons. 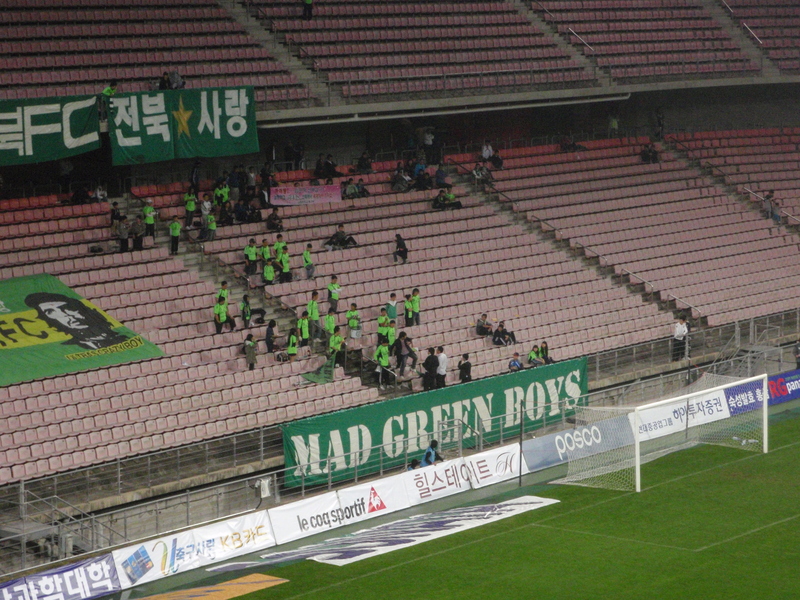 I haven’t been to Ulsan yet so I’ll probably make my way there and see how Jeonbuk get on. Jen spotted this one on a poster somewhere and so we thought we’d go along and see it. The tickets ranged from twenty two thousand won for seats towards the back to over a million won for the VIP ones at ringside. I decided to go for the cheap seats as five hundred quid for sitting at the front seemed a bit excessive. 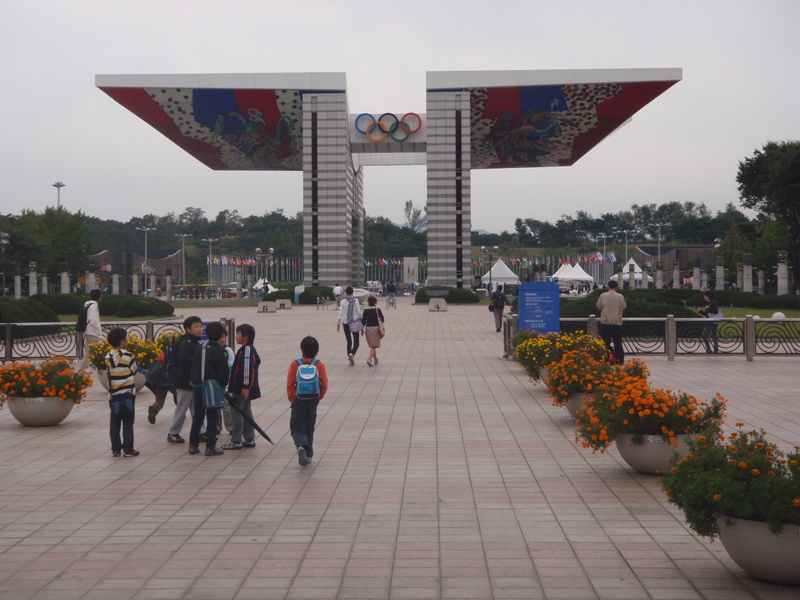 The venue for the event was the Olympic Park Gymnasium in Seoul. I googled it to find out if it was the place where Lennox Lewis won his Olympic Gold in 1988 and where Roy Jones was robbed of his, but it wasn’t. It was however, as you may have guessed, the place where the gymnastics was held. I hadn't been here before. It's worth a wander around. We got in at about half past two and took our seats in the outer tier. I reckon the place was probably about a third full, although I’m not sure how many people the place held, perhaps about five or six thousand I suspect. The posters hadn’t mentioned kickboxing, just K1 and I wasnt really sure what to expect. I wondered if it might be that MMA stuff that seems more like a scrap in a pub car park, but it turned out to be kickboxing, with more emphasis on the boxing than the kicking. 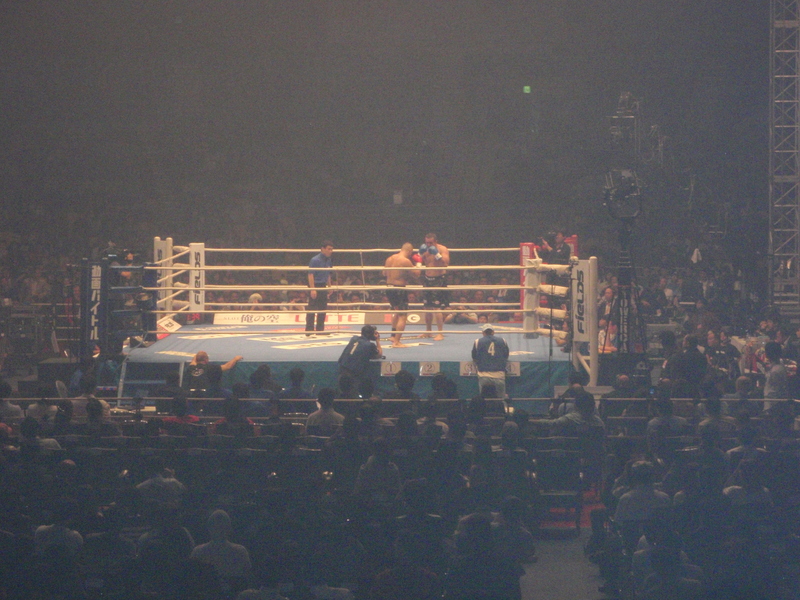 There was an initial bout that didnt really seem part of the main event. It was between a couple of Korean blokes and one of them laid the other out within a few seconds. We then had a half hour wait before the event proper started. 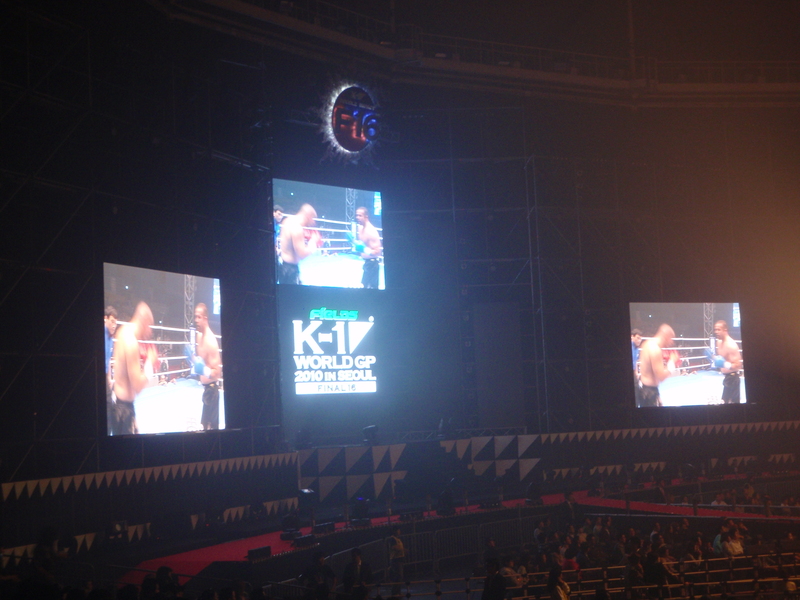 There were three big screens to the side of the ring and we couldn’t really see them properly from where we were sat so we moved further round and then down into the next section closer to the ring. Most people in the outer section were doing the same and as there was plenty of room nobody seemed bothered. 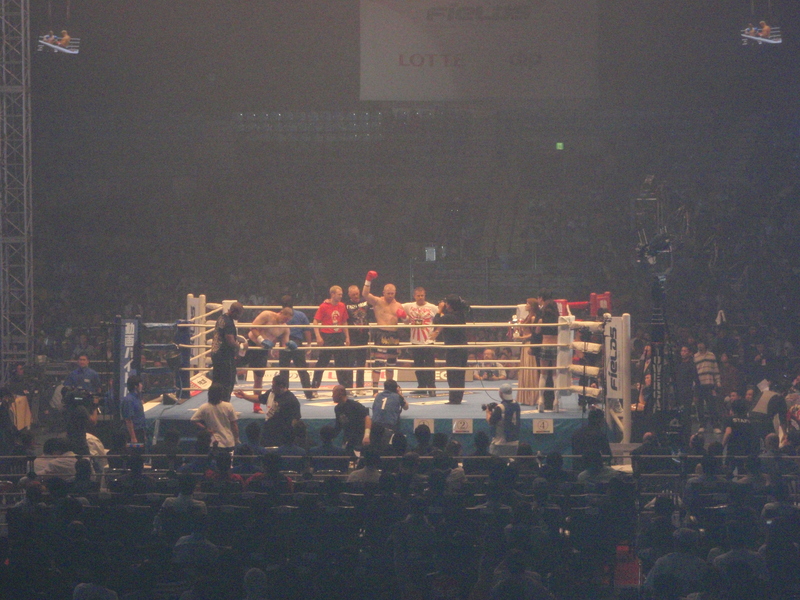 All of the fighters were introduced one by one at the start, lining up alongside some quite impressive flames. They were all heavyweights and each of the fights was to consist of 3 x 3 minute rounds. I wouldn't argue with any of them. Before each fighter did his ringwalk there would be a video reel with footage of his background and of his previous fights shown on the big screens. It was a very handy thing to do, particularly as I had no idea about any of the boxers and it provided a bit of interest between bouts. Just in case anyone forgot their glasses. The fights were worth watching as the short format meant that they had to get about each other from the start, a bit like boxing’s ’Prizefighter’ events I suppose. We saw a few knockouts and stoppages, whilst other bouts went the full three rounds. 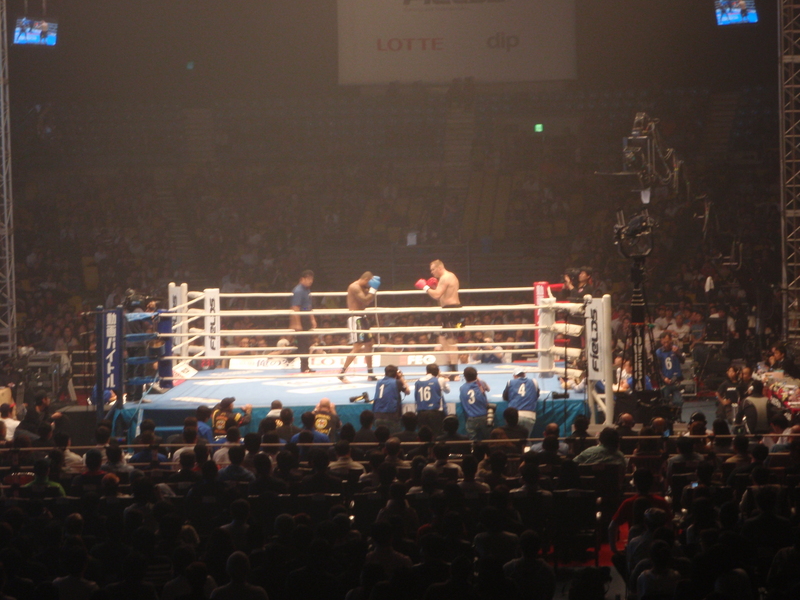 At the ends of rounds 1 and 2, the scores were shown on the big screens, so the boxers and the crowd knew exactly what was required in the remainder of the fight. A couple of the contests ended in draws and I was surprised to see that the solution was to fight an extra round to determine the winner. One other notable difference to boxing was that they didnt allow fighters to box whilst they had blood on their faces. The clock was stopped and they were cleaned up before continuing. I don’t know what would have happened if the doctor or second had been unable to stop the bleeding. The crowd was fairly quiet. With a few odd exceptions I think most people had come to see the event as a whole rather than to support a particular fighter. 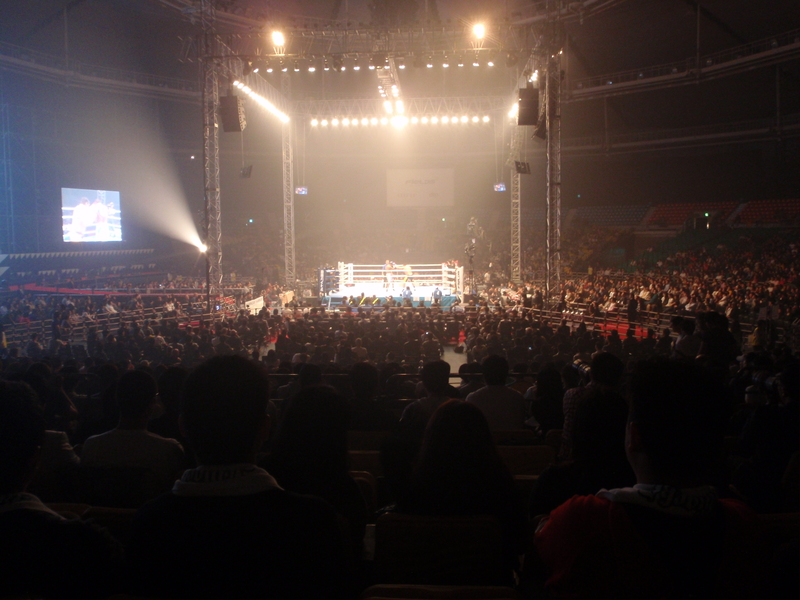 There didnt seem to be much difference in quality between the early fights and those at the end of the afternoon, so everyone bar the typical Korean latecomers watched all of the bouts rather than staying in the bar until the main event, as happens so often at the boxing in the UK these days. 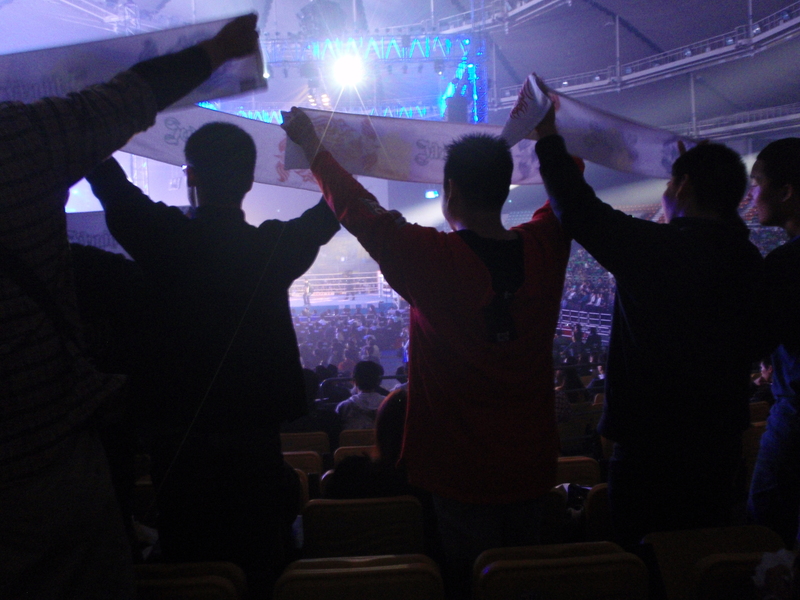 The lads in front of us seemed to pick fighters at random and then support them as if they were family. They rarely managed to pick a winner though, perhaps they had a liking for the underdog. 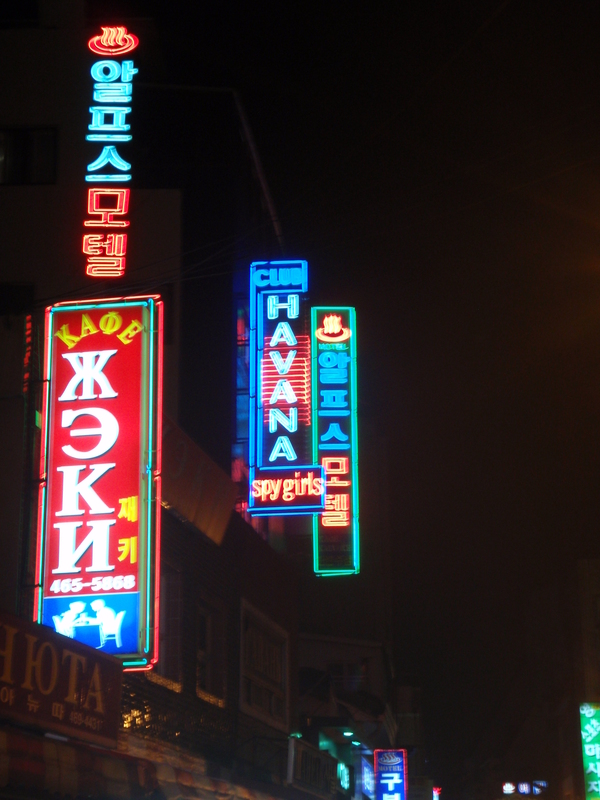 By 7pm we had seen all twelve bouts and we headed off to Gangnam for something to eat and drink. The early finish being a bit of a bonus to what had been an enjoyable afternoon. 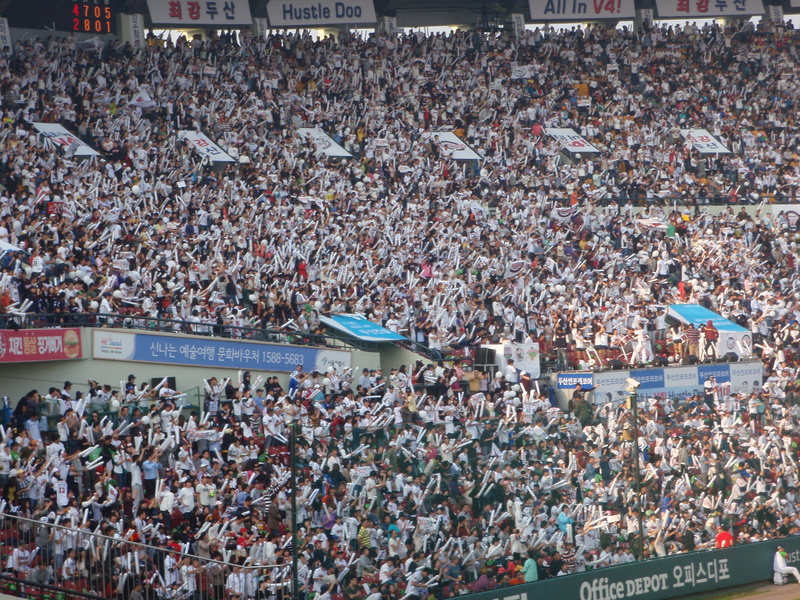 Doosan Bears v Lotte Giants, Wednesday September 29th 2010, 6pm. It’s play-off time. No more meaningless regular season games, we are into the stuff that matters now. 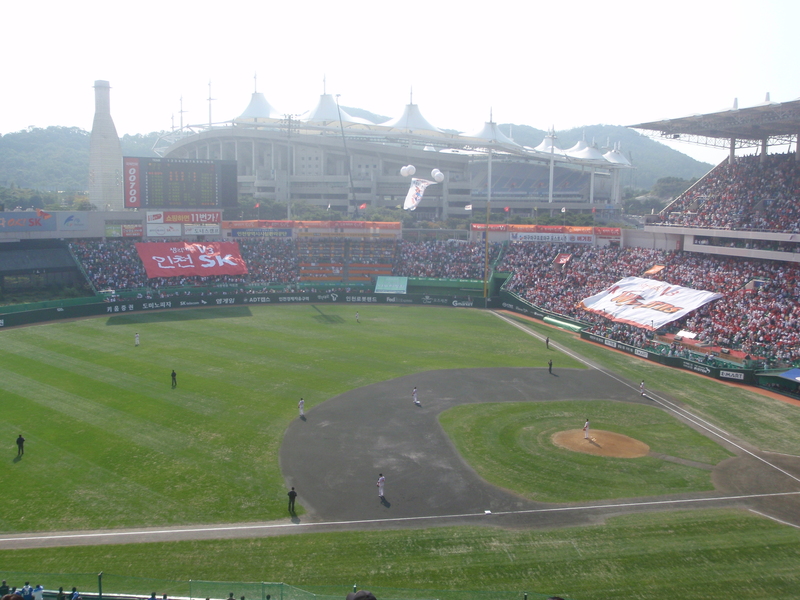 The first best of five contest was between the Doosan Bears and the Lotte Giants, with the winners then taking on Samsung Lions for the right to a place in the Korean Series against SK Wyverns. 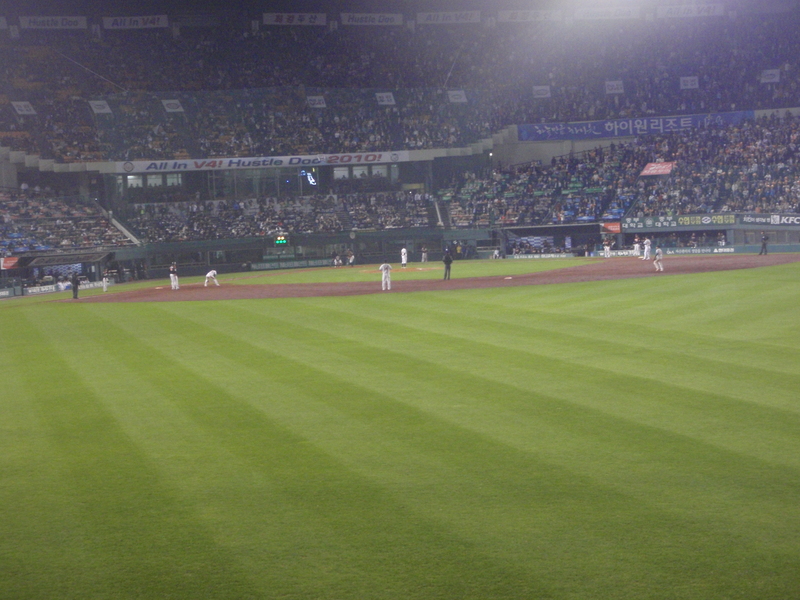 The Giants play in Busan, whilst the Bears are based three subway stops away from me at Jamsil stadium. They play the first two games at Jamsil, the third and fourth (if a fourth is necessary) at Busan and then (again if necessary) a fifth and final game at Jamsil. I’d popped along to the stadium the day before at lunchtime to see if I could get tickets but the offices were shut. I suspected that they were probably available on-line or had been at one point, but the English section of the Bears website wasn’t a lot of help. Not to worry, there are always tickets to be had outside. I don’t think I’ve ever not got into a game that I’ve wanted to, although sometimes I’ve paid a bit more than I should have. 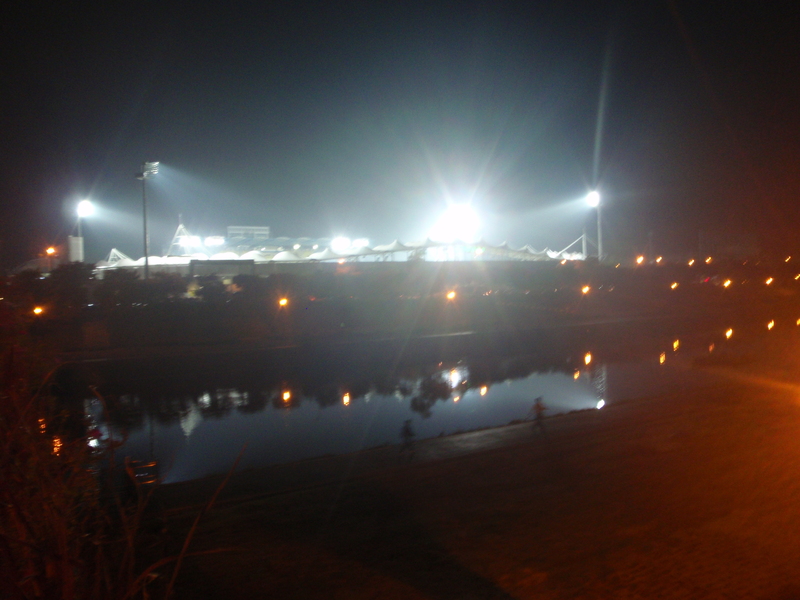 I arranged to meet Jen outside the stadium at twenty past six, which was the earliest I could get there after work. By the time I arrived she had already texted me to let me know she had managed to get a couple of tickets. She’d bought two 15,000 outfield tickets for 20,000 each. That’s not the sort of profit that will let the touts retire. The outfield is free seating and at first we struggled to find seats. I’d say it was probably ninety percent full at that stage, with most of the remaining seats being occupied by coats, handbags and boxes of fried chicken. People were standing three or four deep behind the railings at the back of the terrace. 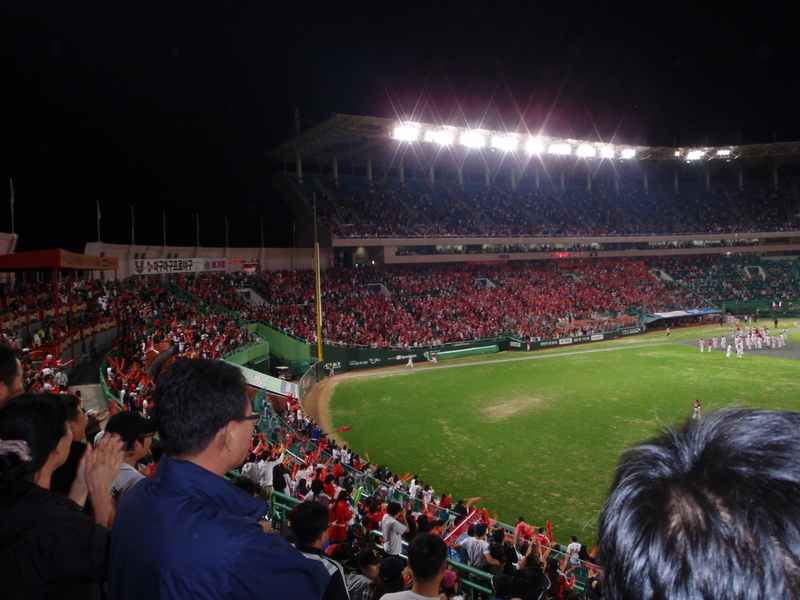 We eventually found a couple of empty seats on the first base side of the stadium, which meant that we were in with the Doosan Bears fans. 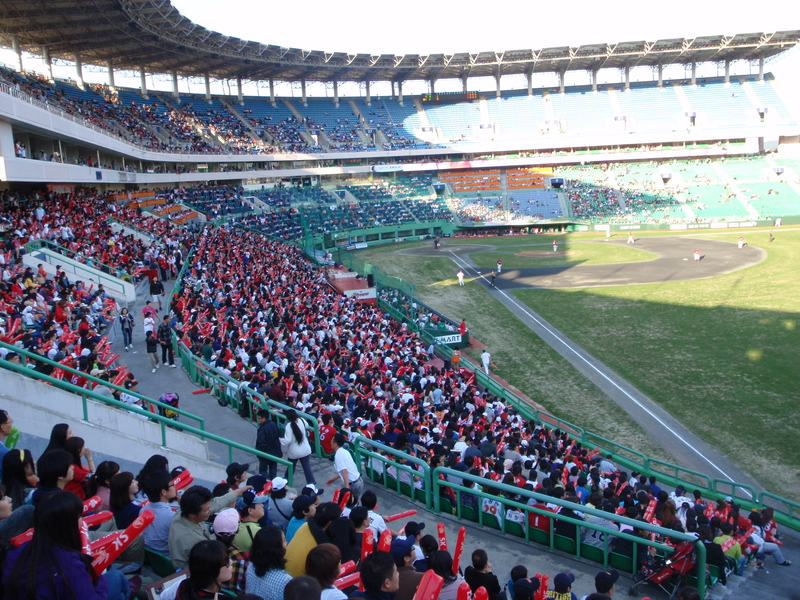 The crowd, including the outfield, was fairly equally split between the two teams which surprised me when I considered that Busan is two hundred miles away. Looking across at the main stand, quite a few of the seats had yet to be filled. I suppose if you have a reserved seat and can’t get there for the start, it’s not so much of a big deal. We hadn’t missed much in that first half hour. One innings had been completed and it was still scoreless. It was noticeably colder though than the last time we’d been here. In fact it was noticeably colder than the previous weekend. It seemed as if we had gone from summer to winter within three days. Autumn is supposed to be the best season over here and I’d been hoping that it lasted a little bit longer than seventy-two hours. Something else that had changed were the player’s averages. Whenever a new batter comes in his number of home runs and average is shown on the scoreboard. It’s very handy for someone like me who cannot tell one player from another, to be able to see which of them are the high scoring players. Not now though, all the averages are set to zero again for the play-offs. For the first couple of innings I was under the impression that both coaches had for reasons unknown sent out teams of rookies for their biggest game of the season so far. 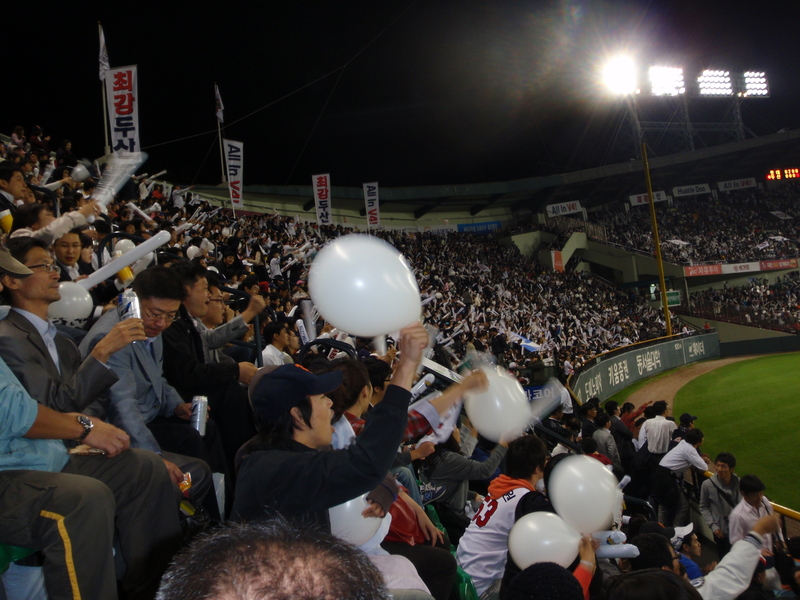 Both sets of fans were entertaining, the home fans all blew up and waved white balloons early on. Lotte Giants responded with a couple of large surfers that must have taken some manhandling to get them to an away game. How did they sneak those in? 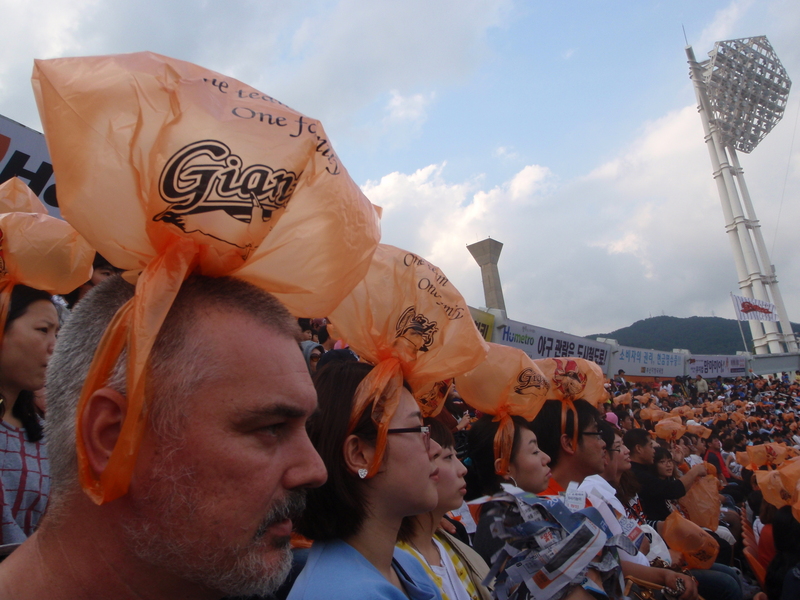 They then followed this up with the wearing of blown up orange plastic Lotte supermarket bags on their heads. Look closely, the orange things are supermarket bags tied to their ears. Impressive, if a little mad, particularly when one of them would have to go to the bar by himself. It looks better in a crowd. 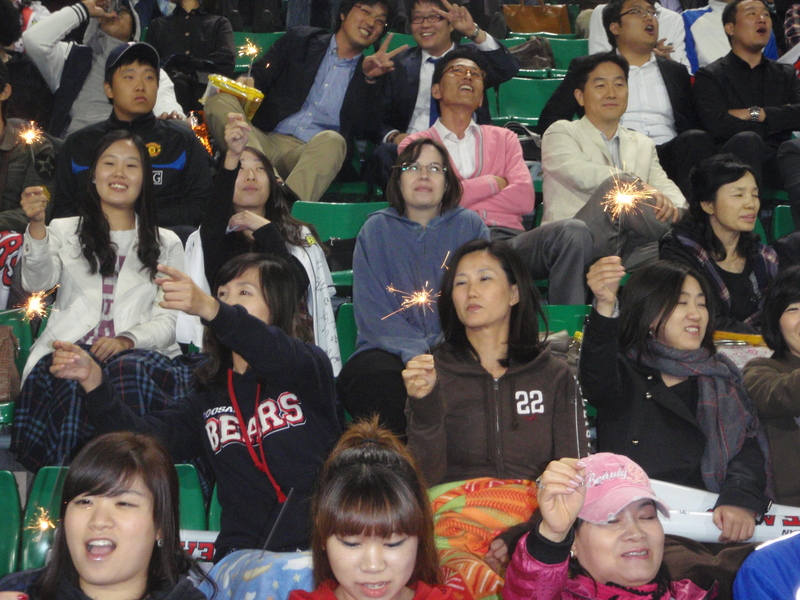 Finally the Doosan Bears fans managed to distribute sparklers to everyone in their section bar us. That's much better than plastic bags tied to your ears. It’s probably not surprising that I wasn’t given a sparkler as I have a bit of history with them. As a small child I was given one to hold and as it burnt downwards towards my hand I passed it over to the other hand, grasping the burnt, but still extremely hot, other end. Because she was sat next to me, Jen wasn't allowed a sparkler either. That was the last time I was trusted with a sparkler. Perhaps my Mam had been in touch with the Doosan fans to make them aware of the risks of letting me join in. 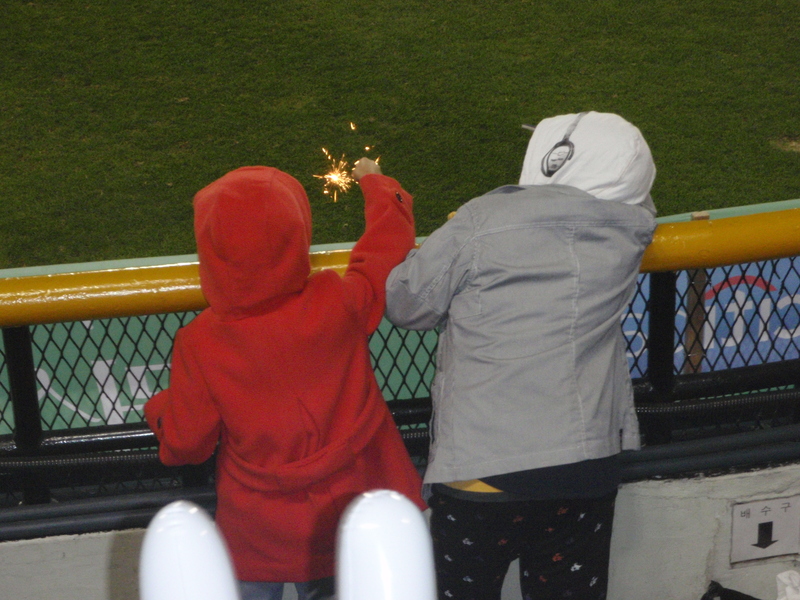 Not that I'm bothered, but even small kids got a sparkler. The game itself was close and the advantage switched around early on. The Giants went two up in the second innings, causing the three Doosan supporting girls in front of us to complain bitterly to anyone nearby who cheered and to suggest that they clear off to the other side of the stadium. Generally there isn’t any bad feeling amongst rival supporters here, or at least I haven’t noticed it. Perhaps with the stakes being a bit higher, the passion is starting to show a little more. 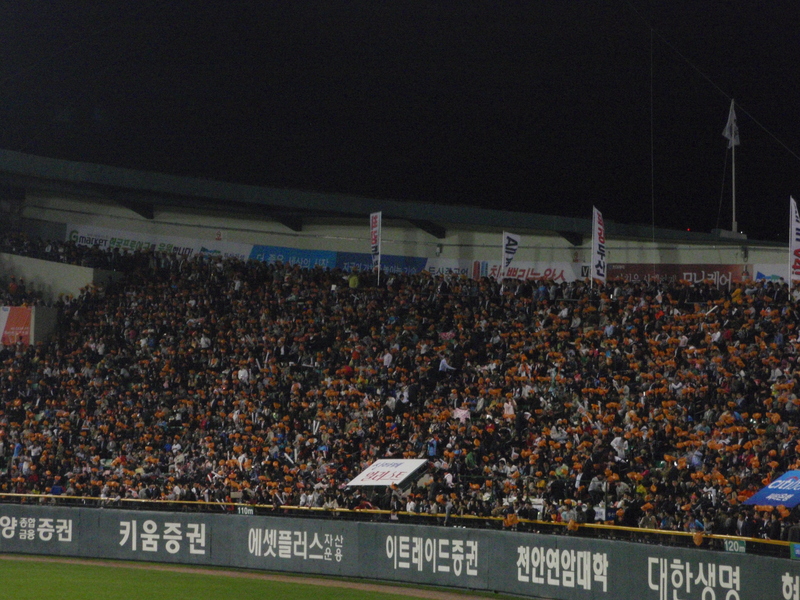 The Doosan fans cheered up in the fourth innings as the Bears took a 3-2 lead, before relinquishing it in the fifth as the Giants nudged back in front at 4-3. In the sixth it was Doosan’s turn again as two more runs took them into a 5-4 lead, only for Lotte to level it up at five all in the seventh. Still level after the 8th. After a scoreless penultimate innings it all went wrong for the Bears in the ninth as a Jeon Joon Woo home run for Lotte sparked a Doosan collapse that led to another four runs in quick succession. We left with the score at 10-5 and that’s how it finished. There are plenty of restaurants around the Sports Complex area and as neither of us had had our tea that’s where we went. It’s a fairly busy area and as we ate the chicken that had been cooked in a big bowl at our table we were able switch attention between the match highlights on the telly and watching the drunk blokes outside trying it get their even drunker work colleagues home safely. If the play-off isn’t over after the first three games, I’ll probably nip down to Busan on Sunday for the fourth one. 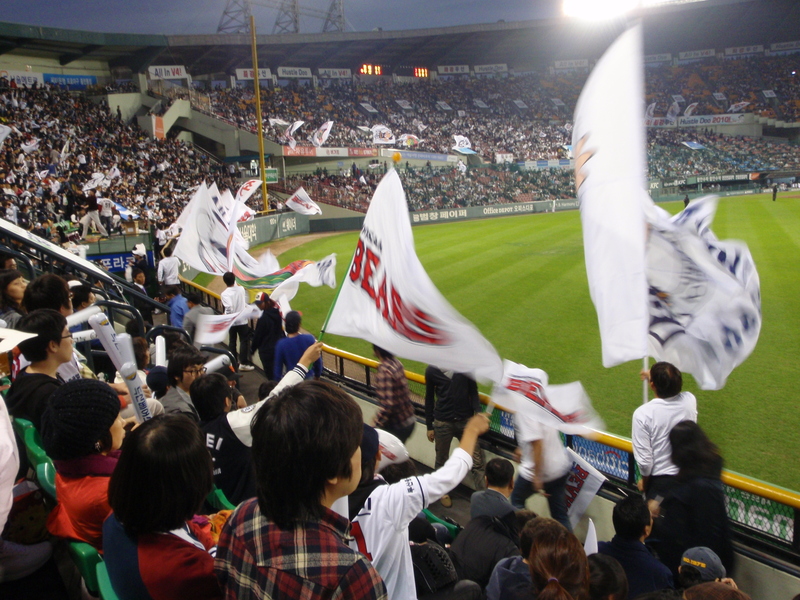 SK Wyverns v Nexen Heroes, Sunday 26th September 2010, 5pm. The baseball season has been limping towards the end of the regular season for a while now, with the four play-off positions having been determined what seems like ages ago. This though, really was the end, the 133rd and final game for each side. I hadn’t even been aware that this game had been on until my friend Paul and I arrived to watch the Incheon v Jeonbuk football game at the stadium next door. The final few fixtures tend to be ones that have been re-arranged, often at short notice and the information can be a bit unreliable. Earlier in the month I’d turned up at this stadium for an advertised game only to find that the Wyverns were actually playing two hundred miles away in Busan. As we were here though, it would have been a shame not to have gone in and watched. They have beer and pork dumplings and it was a sunny day, although starting to get a little cooler as summer finally seemed to be slipping away. There’s times when I would have paid far more than the eight thousand won ticket price to sit in an empty stadium for that combination. Late afternoon, late summer, late season. SK Wyverns are top of the league and they will be going straight into the final of the Korean Series where they will play whichever team emerges triumphant from the play-offs. It won’t be Nexen though, they have had a poor season and have ended up second bottom of the eight teams. With the result not really mattering both sides took the opportunity to give some of their fringe players a run out. SK used a couple of pitchers in the early stages that Nexen didn’t have any trouble in taking a few runs off. At 4-0 down in the third, with the bases loaded and the game slipping away, SK decided enough was enough and brought on a pitcher who, judging by the enthusiastic reaction of the home fans, had at least played the game before. The new lad rattled through the Nexen batters at a fair rate, stopping them from scoring any more until it was decided to give someone else a turn in the seventh innings. 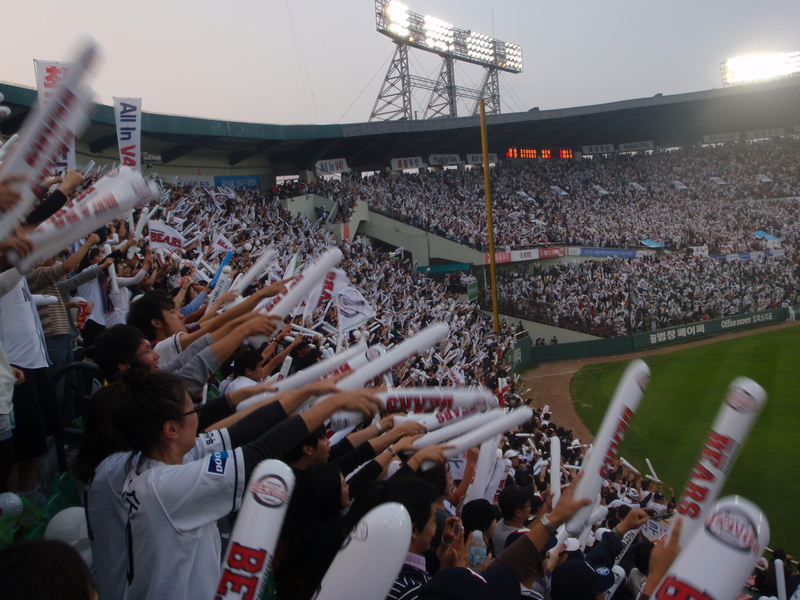 At that stage though it was still 4-0 to Nexen, the SK Wyverns batters demonstrating the same apparent unfamiliarity with the sport that the early Nexen pitchers had. 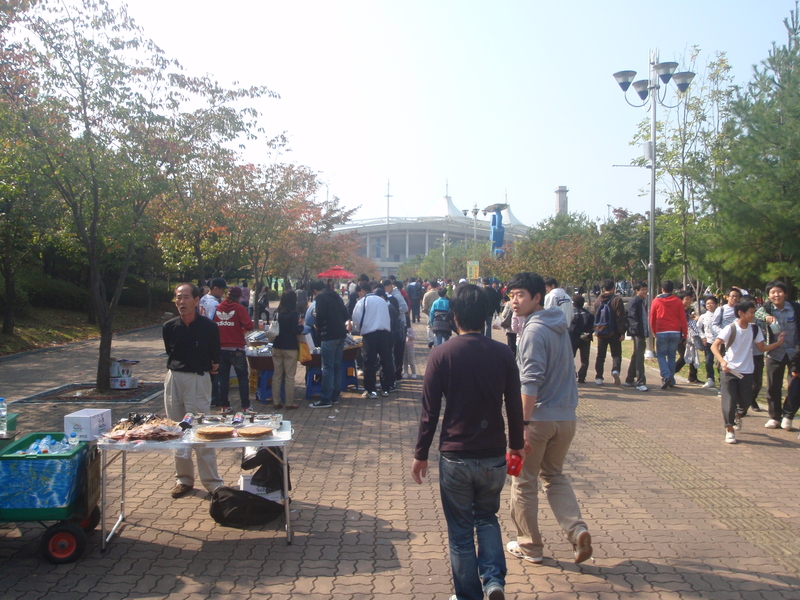 The food stalls were quiet too. It all changed in the eighth innings though as SK decided to send in a couple of blokes who at least managed to grip the right end of the bat. Nexen tried to cheat a bit by deliberately pitching wide and ‘walking’ them, or at least I assume they did, perhaps the throws were as close as they could get. Time to light the sparklers. It couldn’t last though and SK quickly rattled off four runs in the eighth to bring the scores level. It stayed that way until as close to extra innings as you can get. SK had two men out in the ninth when, with a bloke on second base, the batter cracked one far enough for his mate to get home for a 5-4 win. It made for an exciting end to what was a meaningless but enjoyable fixture. The crowd was pretty good though, with the stadium being about half full and the Wyverns fans keeping up the support to the finish. There weren’t many there from Nexen, but I suspect they have already put away their gear until next season. 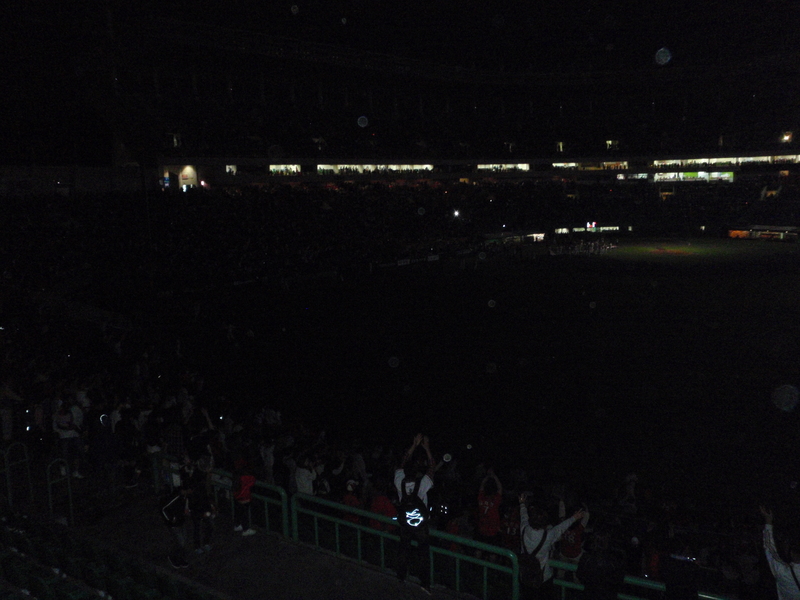 At the end the lights were dimmed for a lap of honour and the Wyverns players threw baseballs into the crowd. An interesting thing to do in the dark. 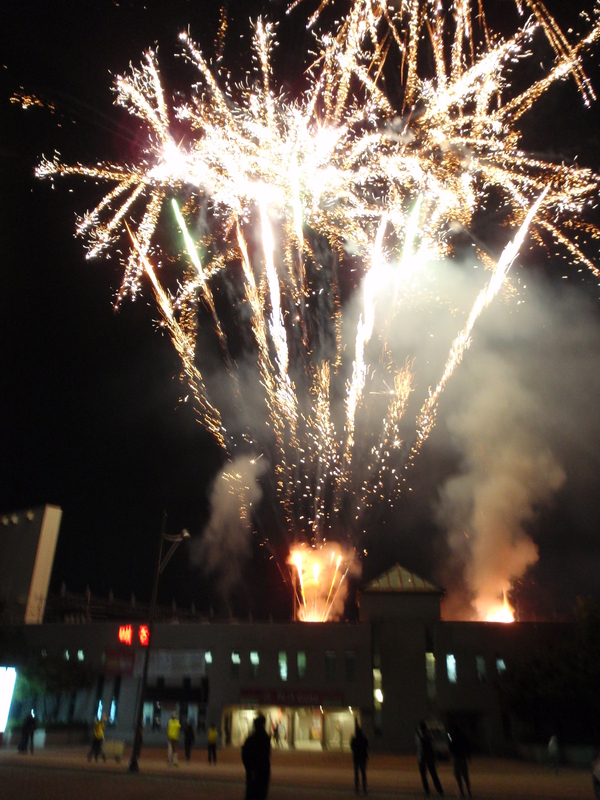 The evening’s entertainment finished with a pretty impressive firework display to round off the season in style. It would have been well worth going even if they hadn’t had any pork dumplings. It’s the play-offs now and I’ll be looking to get to at least one of each of the three pairings, probably ending up back at this stadium in about three weeks time where I expect to see a capacity crowd.